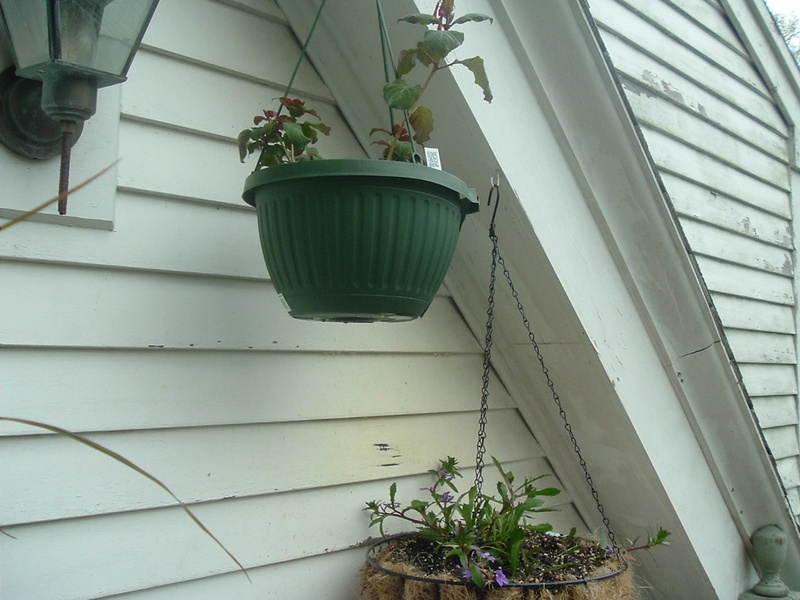 There have been some significant changes since the last time I posted pictures of my deck gardens. I have re-planted new lettuce seeds in one bed because the lettuce was done; however, while that grows, I have another bed of lettuce to use! 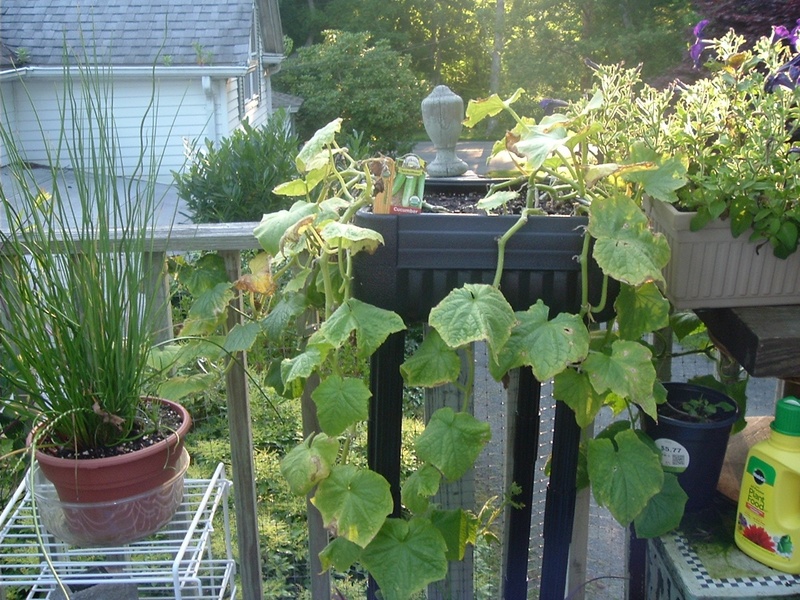 My cucumber plants are huge and are sporting tiny cucumbers with many more to come because there are so many flowers; I have taken a picture of the tiny cucumbers. 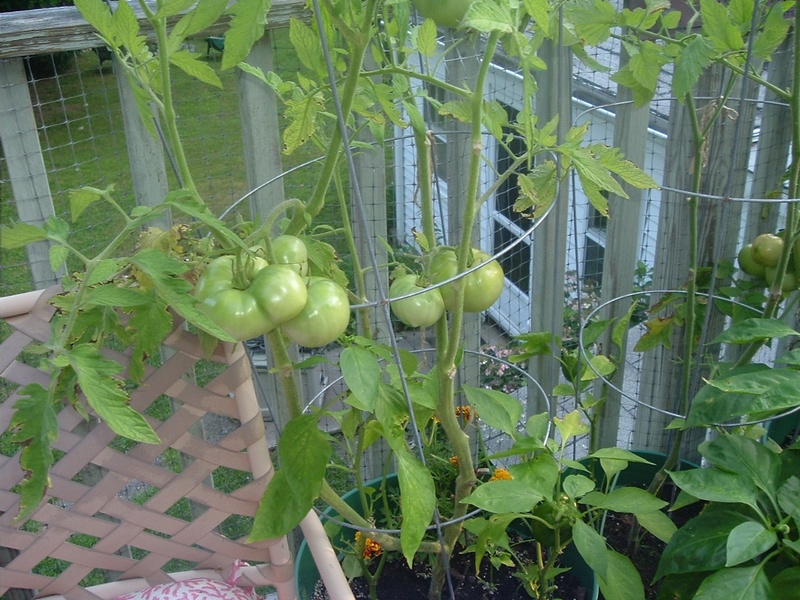 My tomato plants now have tiny tomatoes on them; again I have taken a picture of the tomatoes. 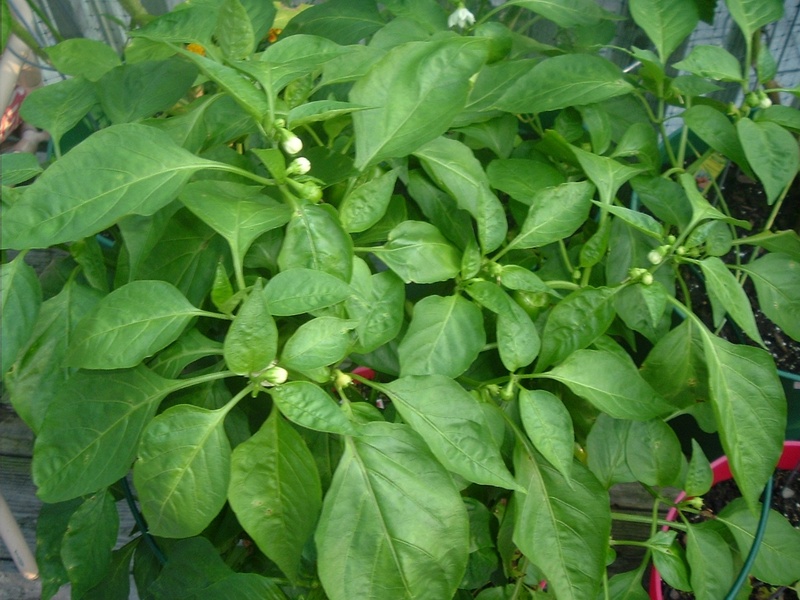 In addition, my peppers also have tiny peppers and I have taken a picture of that. My potato plants are growing and that is a good sign. 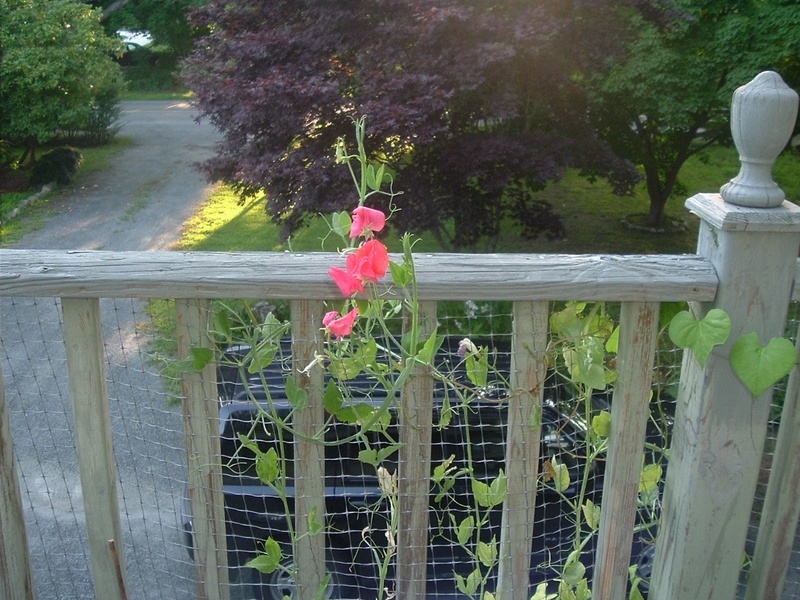 I thought that my peas had stopped producing peas but today I see that there are more flowers on the plants. Great, more peas! 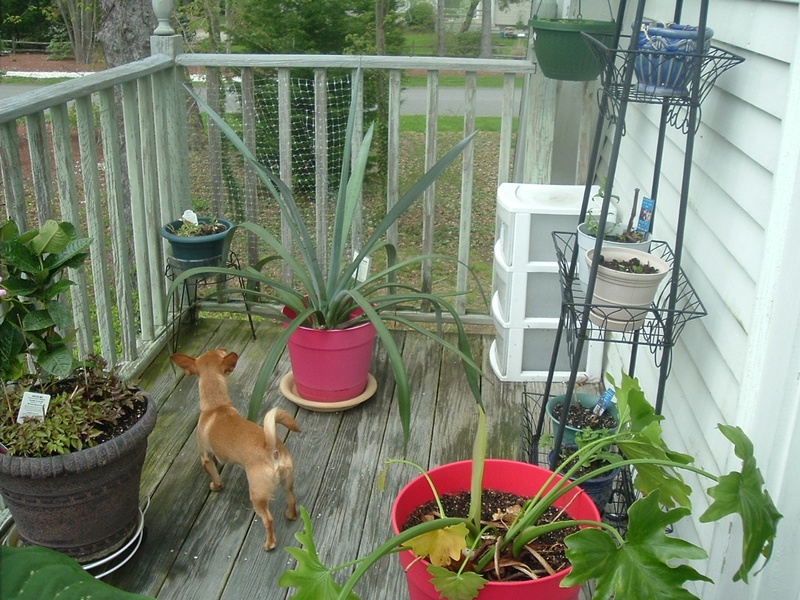 There are pictures of my two dogs on the deck; I could not resist! 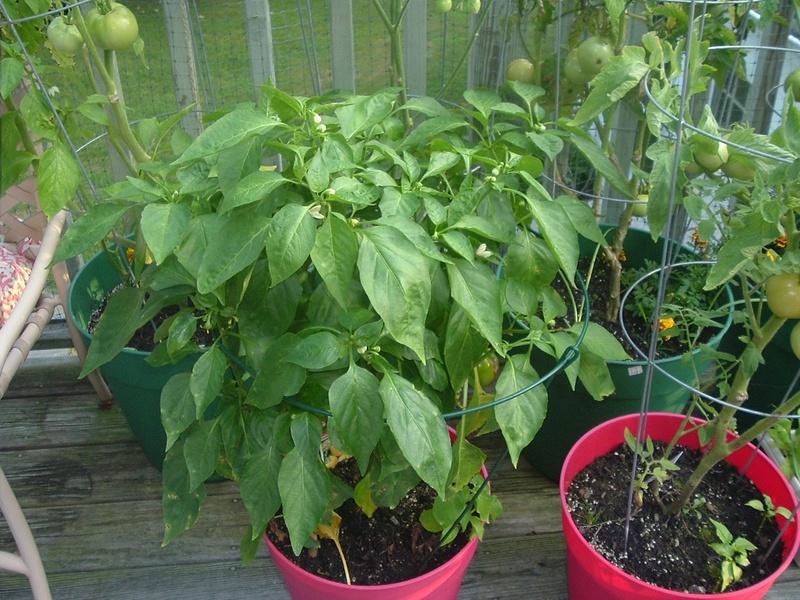 There is a picture of what may look like a small weed; that is a picture of one of my sweet mini-peppers that are growing. Sweet mini-peppers are not easy to grow here because they require a lot of heat; but every year I grow them from seed and every year they produce the peppers that are so tasty! 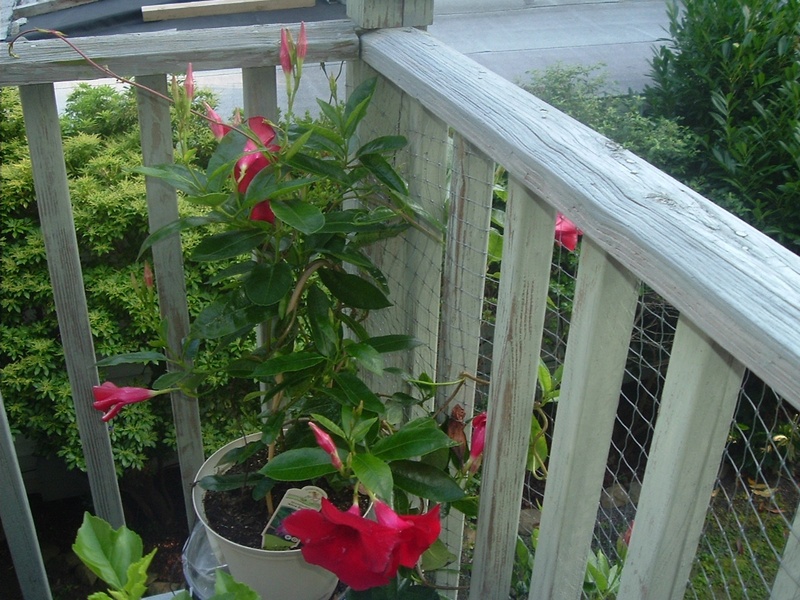 My patio gardenia tree is doing great and produces one flower at a time at this point. 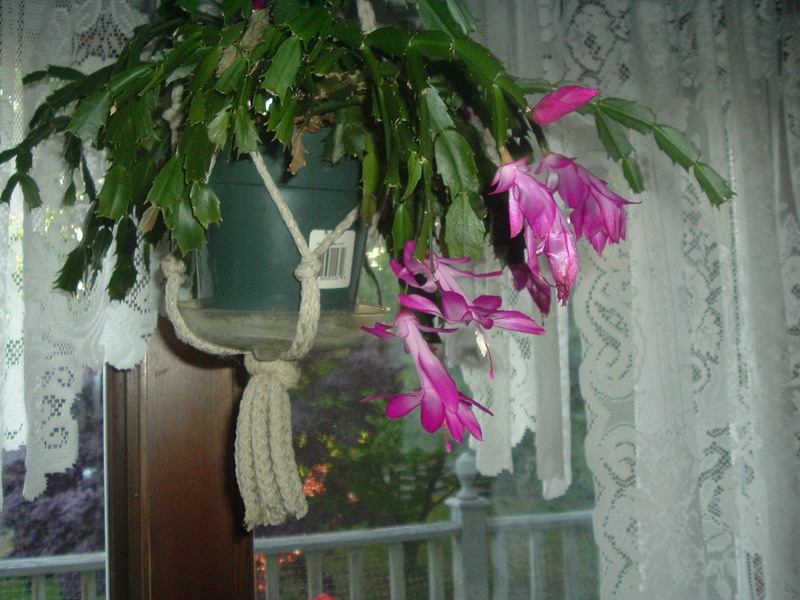 I took a picture of the one flower that is starting to wilt but I know there is another bud on the tree. All my flowers are doing great and I tried to take some close up shots of some of the unusual flowers that I am growing. 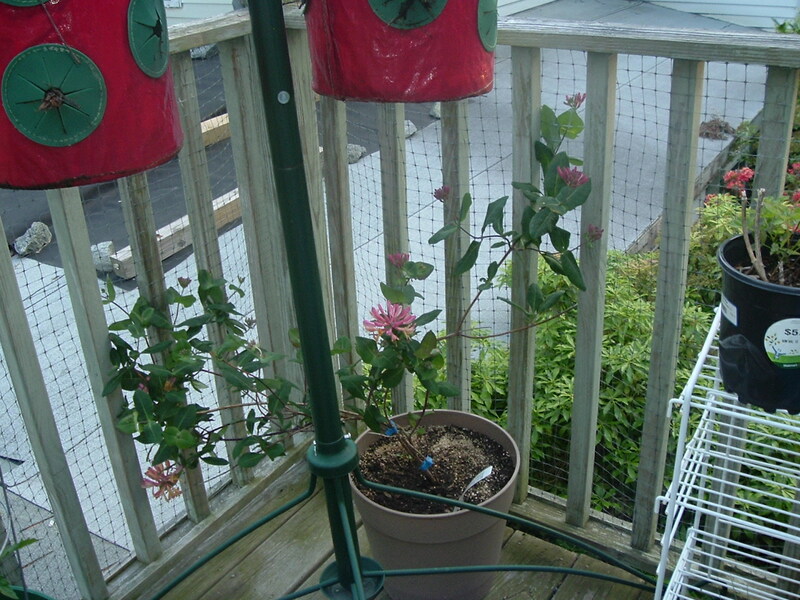 The hummingbirds are constant visitors on my deck; they love to sit on my tomato cages and drink from the hummingbird feeders. Today a male and female yellow chickadees sat on my tomato cages. 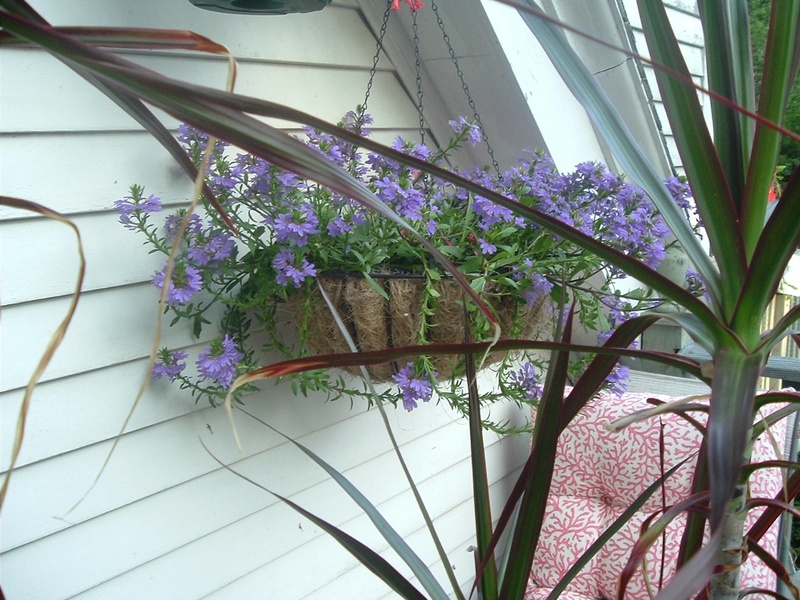 It is surprising what a bit of sun and rain will do to make your garden grow! I have been eating lots of raw peas for two weeks now; very tasty! 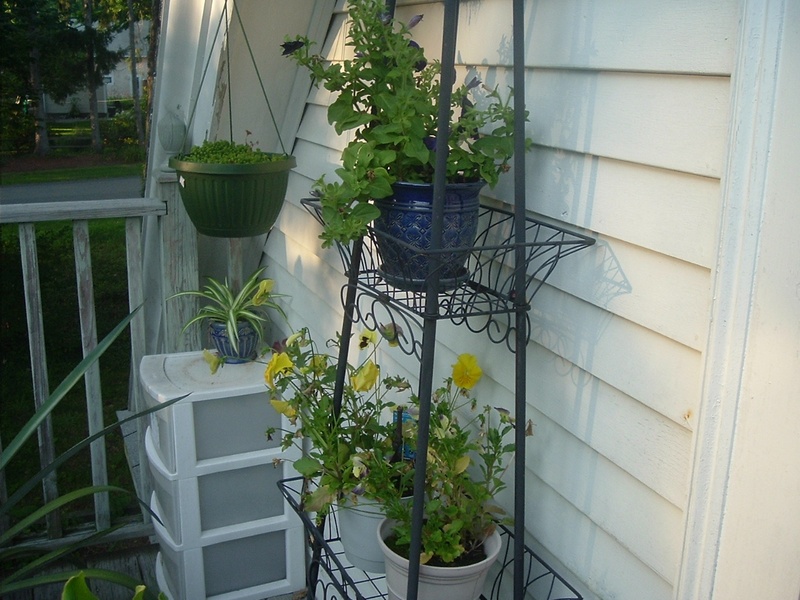 My tomato plants very grown and have flowers on most of them now. 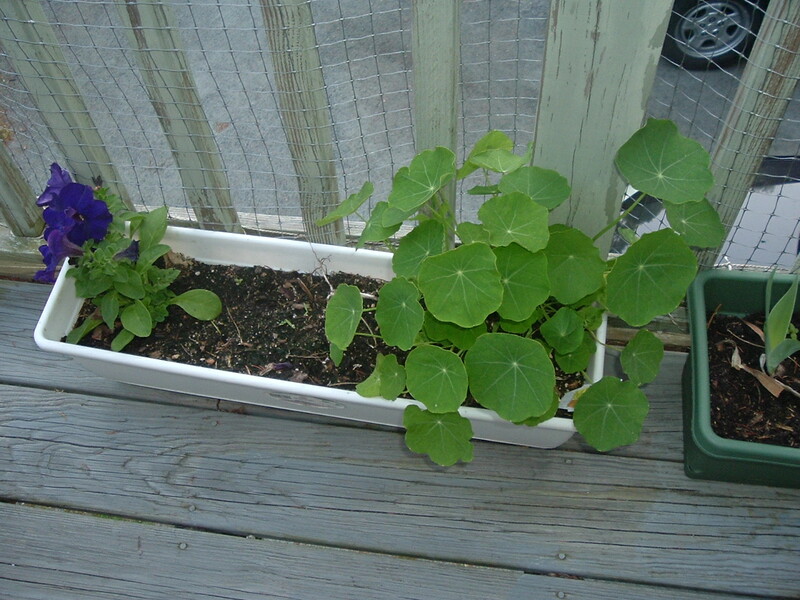 My potato plants finally came up and my cucumber plants are huge with flowers and tiny cucumbers on them. Even my mini sweet peppers that I planted from taking the seeds from the peppers are up! I have one flower on my regular peppers but they have grown in the last week. 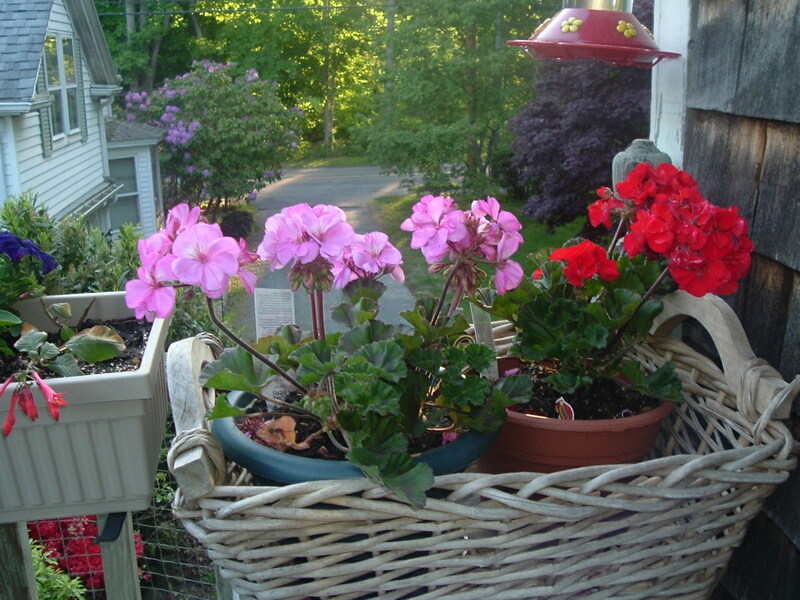 My annual flowers have spread and have beautiful colorful flowers. 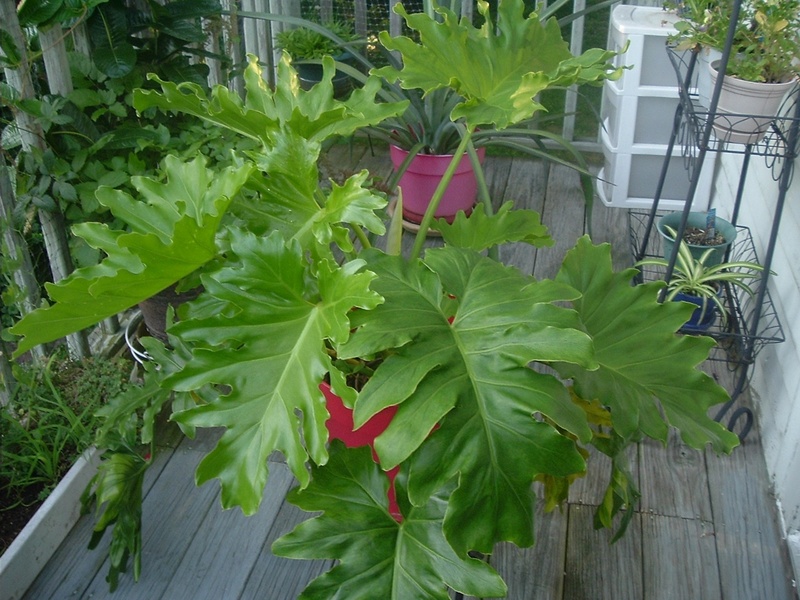 I had to dig up and take many roots off of one of my tropical plants as the roots were wrapping around the tropical itself; I would have liked to have gotten another bigger planter but could not find any in the store this time of the year. My patio gardenia has produced three beautiful white flowers and I noticed today that there is another bud waiting to open. And my rose bush has one flower just about ready to open. All in all, at this point in time, I am very pleased with my garden! Enjoy these pictures! It is the second day of June and finally I can see a difference in most of the things I have planted, except my potatoes! 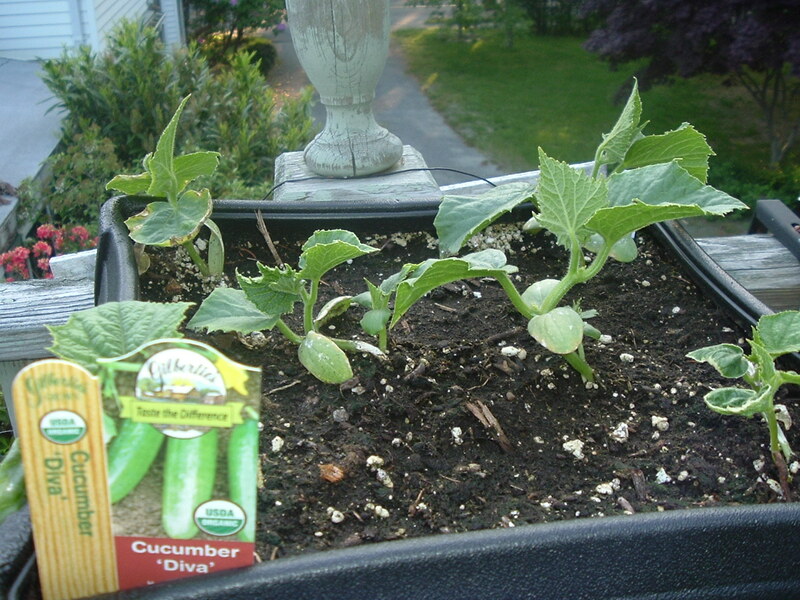 Cucumbers are really growing and my green beans have finally sprouted. 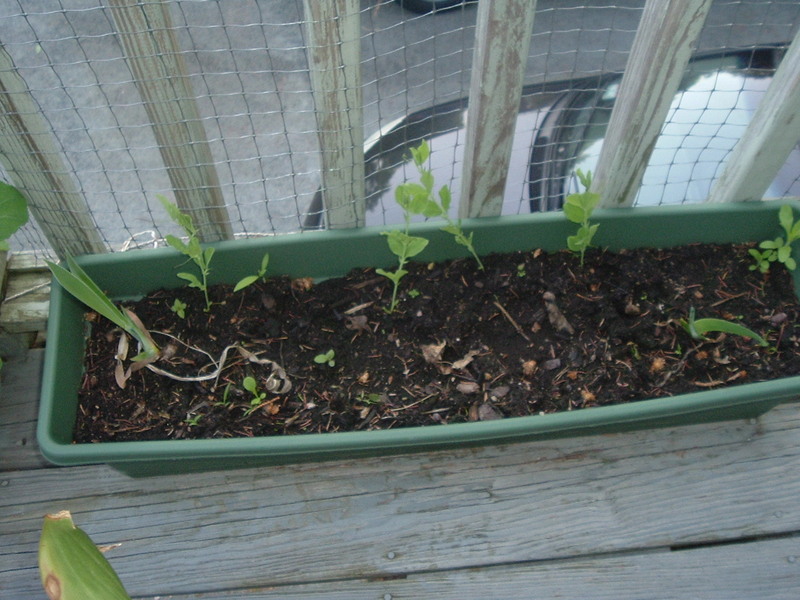 My peas are full of flowers which are a beautiful white and my second planting of lettuce is coming up. 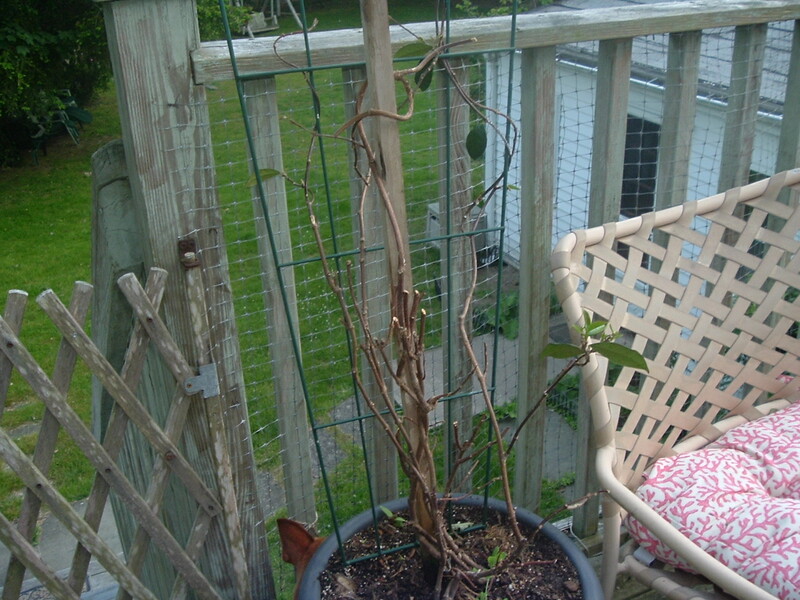 My deck gardenia tree finally gave me a beautiful white flower, which I picked and brought into the house because it smells exotic and there is another flower bud on the tree. 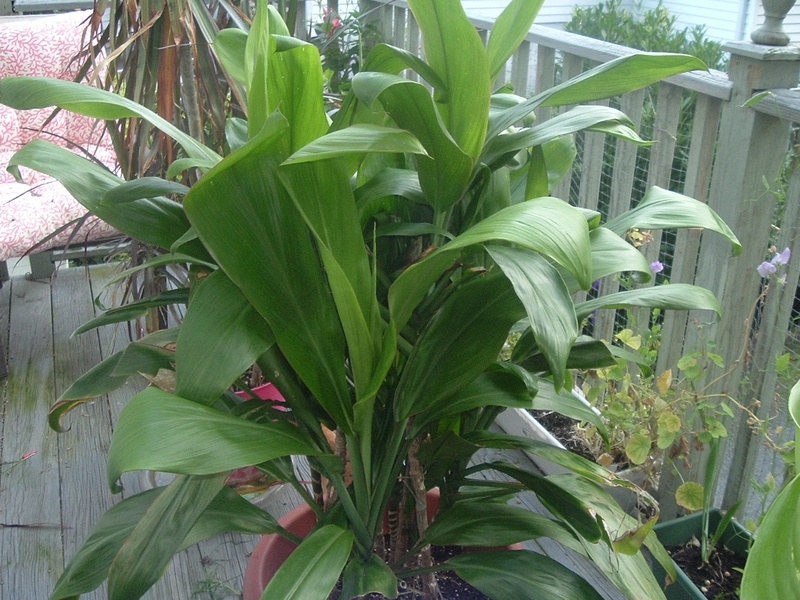 All my tropical plants are outside now and adjusting to the outdoors. 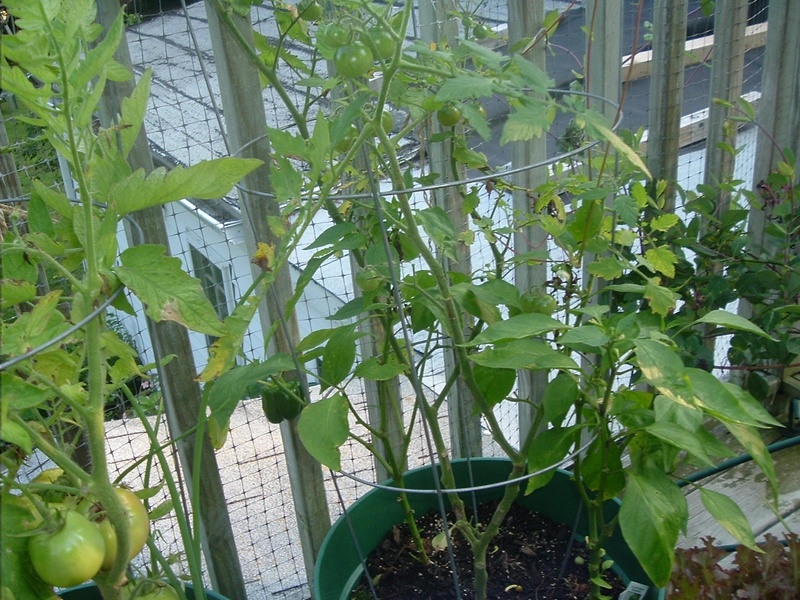 My tomato trees, which I thought would die, are coming up; I am not sure at this point in time if they will grow as tall as they are supposed to. Time will tell. Enjoy these pictures! 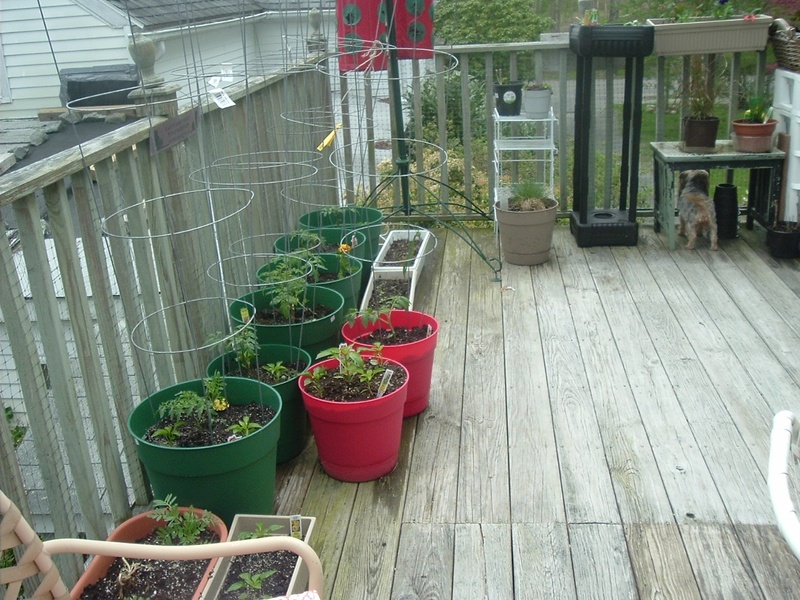 It has been slow process compared to last year’s gardening but my deck gardens are making progress. 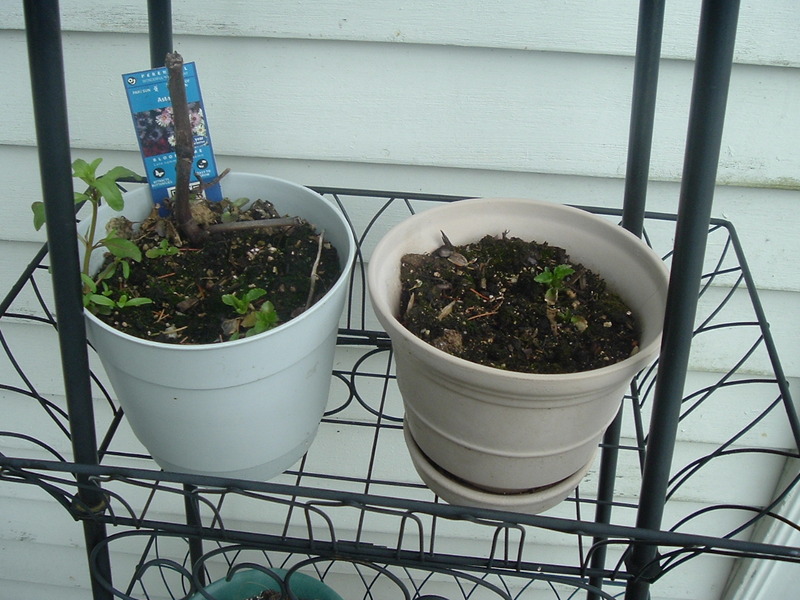 The two tomato trees were delivered damaged but I have seen some progress in their growth, although very slow. I will have to see what comes about with the two trees! 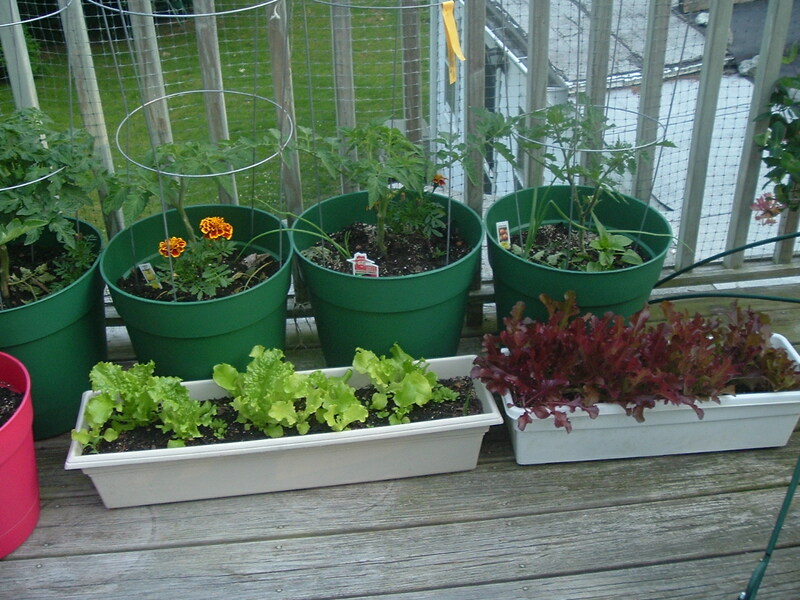 I have been eating lettuce and green onions and have another container that I have planted more lettuce seeds. 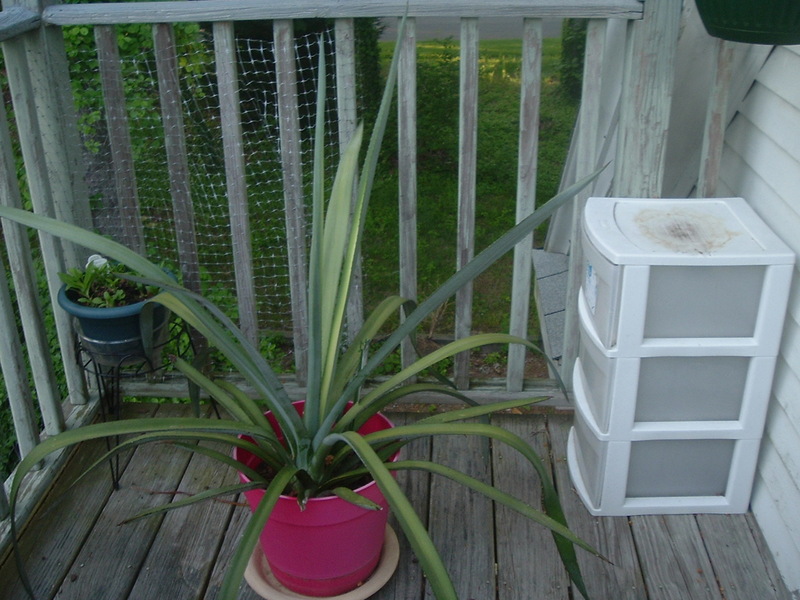 I finally was able to put outside the majority of my tropical plants but there are at least four that I have not put outside yet. Enjoy these pictures, I will post progress throughout the summer! 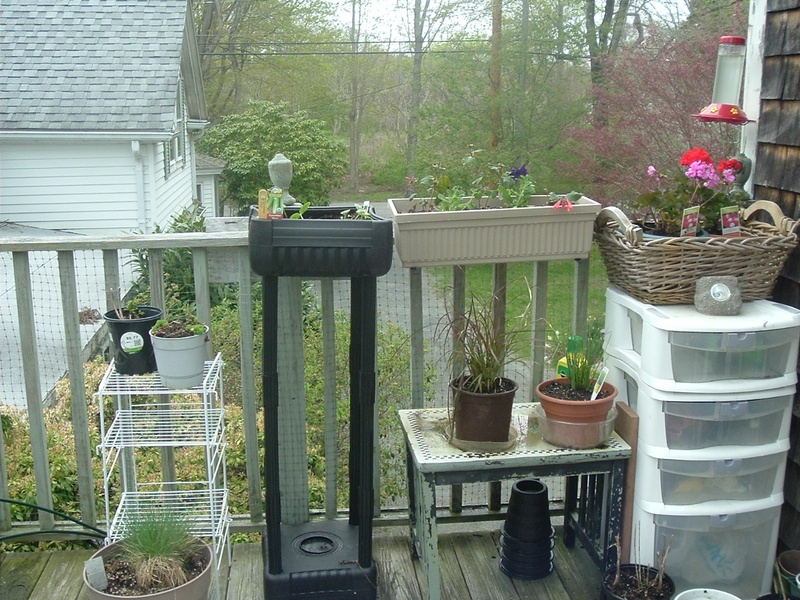 Deck Garden for 2016 is almost planted! 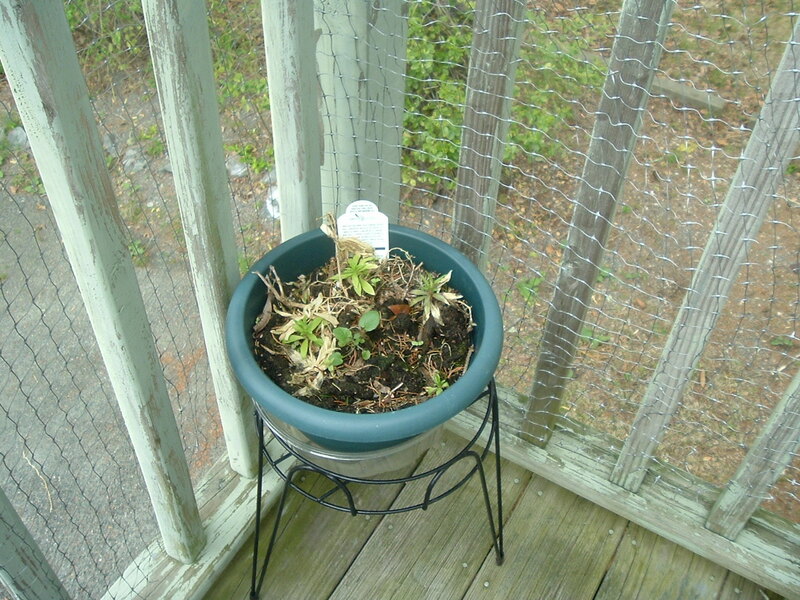 Except for cucumbers, my deck garden is planted for the season. 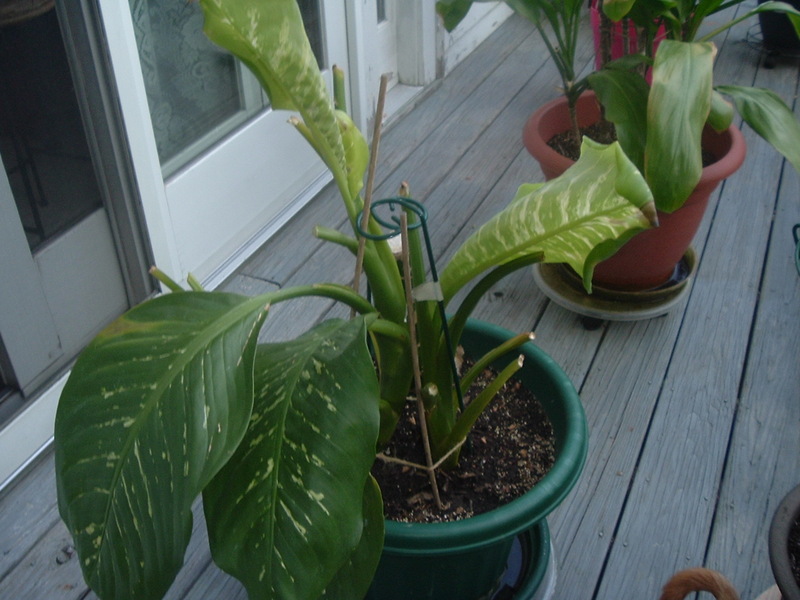 Now, it is too early for my tropical to go outside but the rest is done. 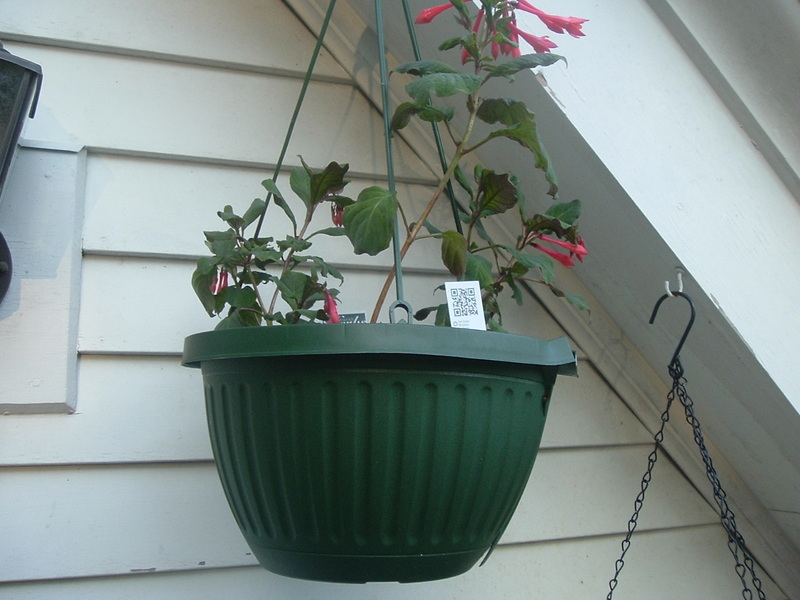 I decided to do a nice clay pot that I painted the trim and placed succulent plants inside for inside and outside on my table when the weather is warmer. 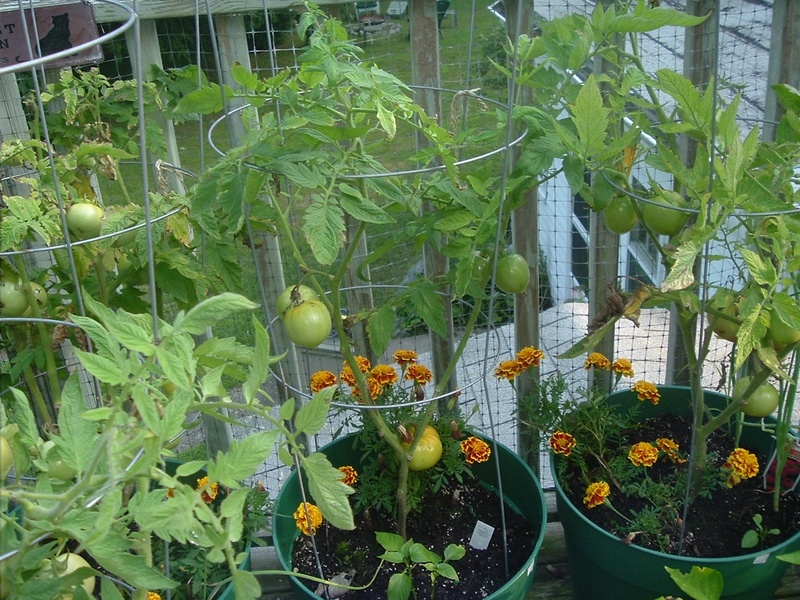 The empty pots have potatoes growing inside them and this year I bought two tomato trees. 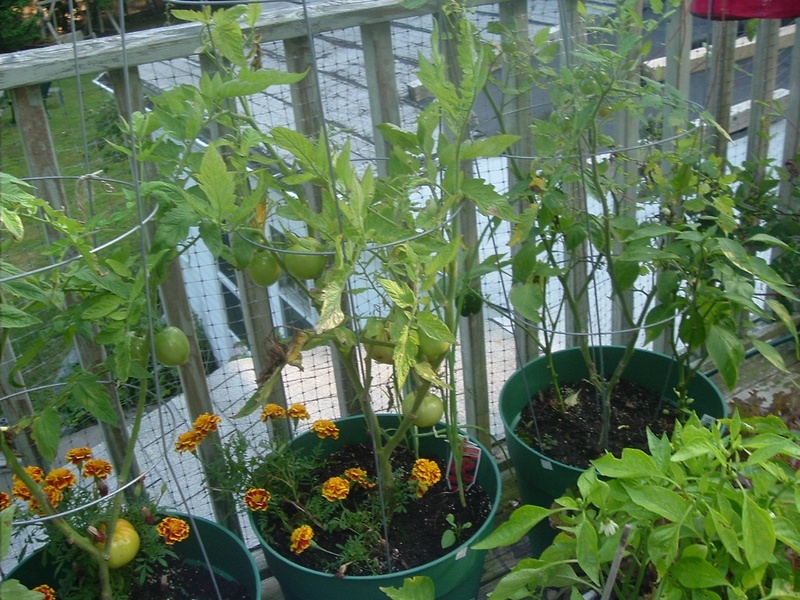 Unfortunately, the tomato trees were damaged during delivery and I am not sure if they will grow or not. 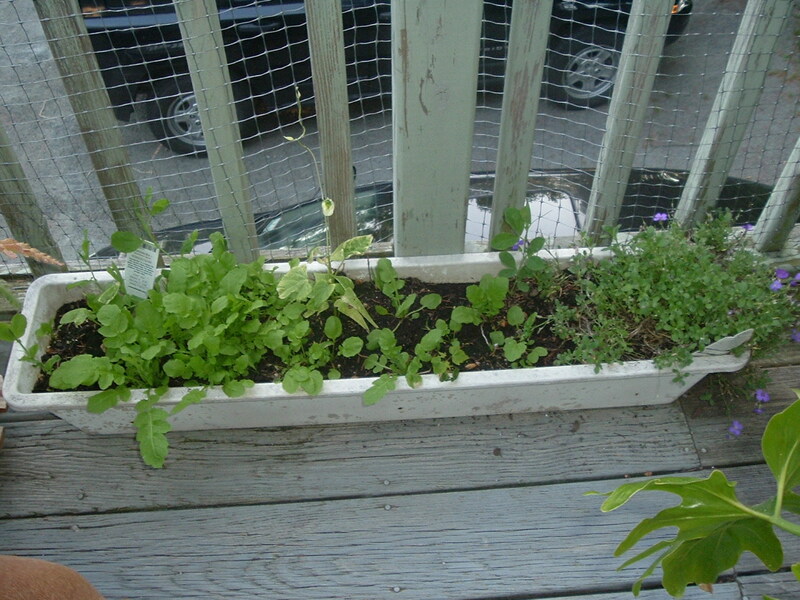 My lettuce is ready for eating and I have eaten green onions already with more already planted. I also decide to grow peas this year too! 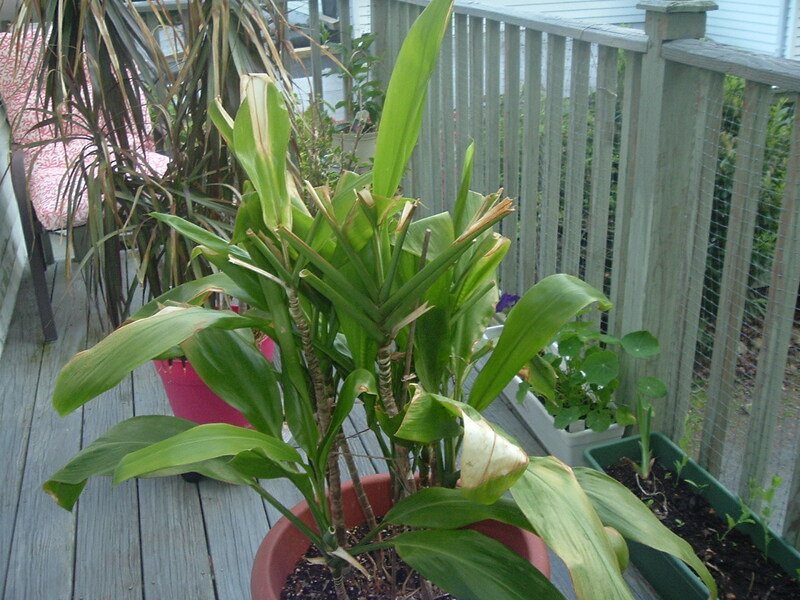 Enjoy the pictures and there will be more to come when the tropical plants go on the deck. 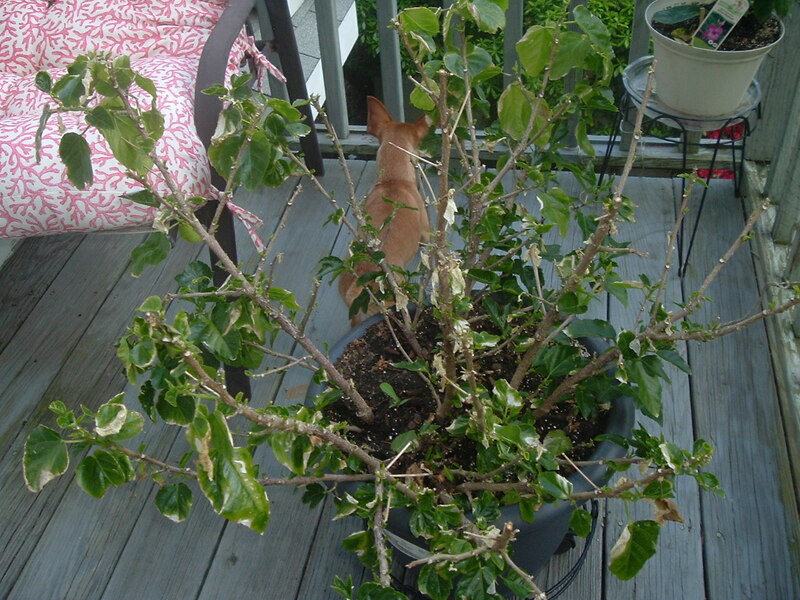 I also had a patio gardenia tree and you will not believe the size of my polka dot begonia! 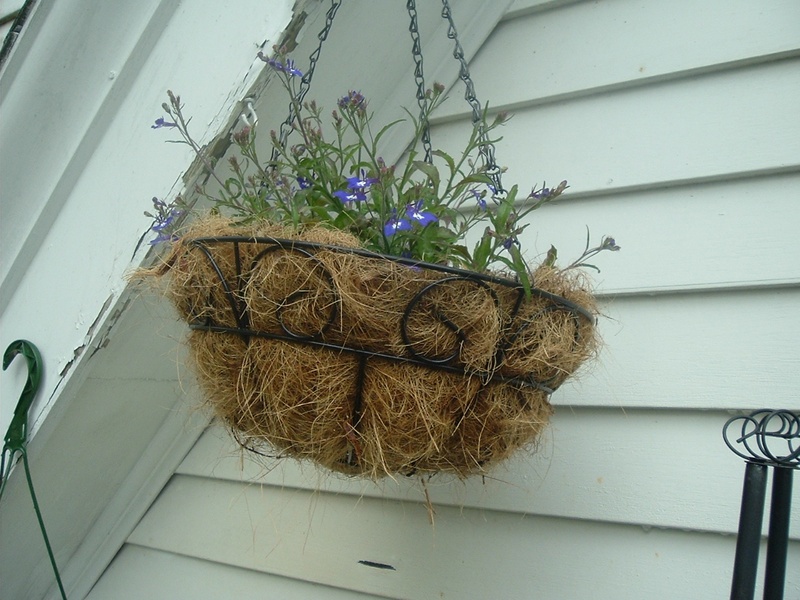 These are inside until the weather warms up! 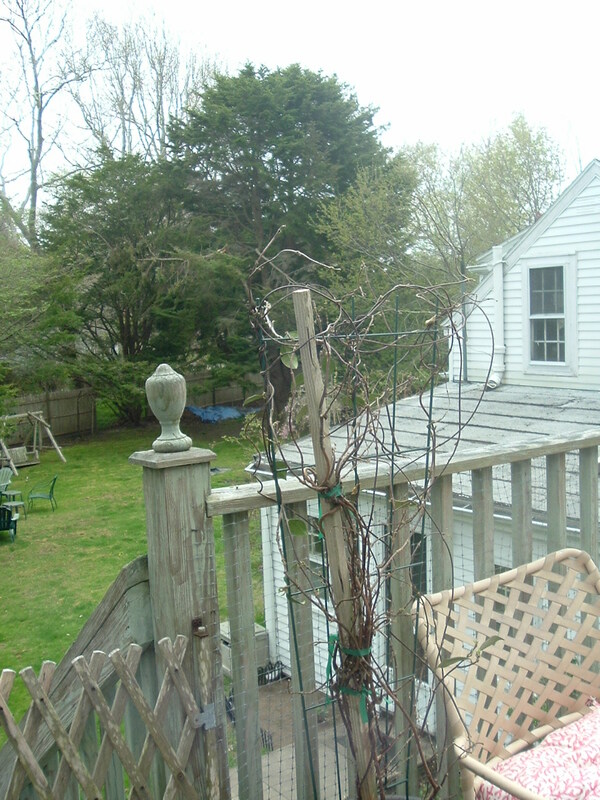 Last note, I saw on my deck drinking from my hummingbird feeder my first hummingbird of the season! 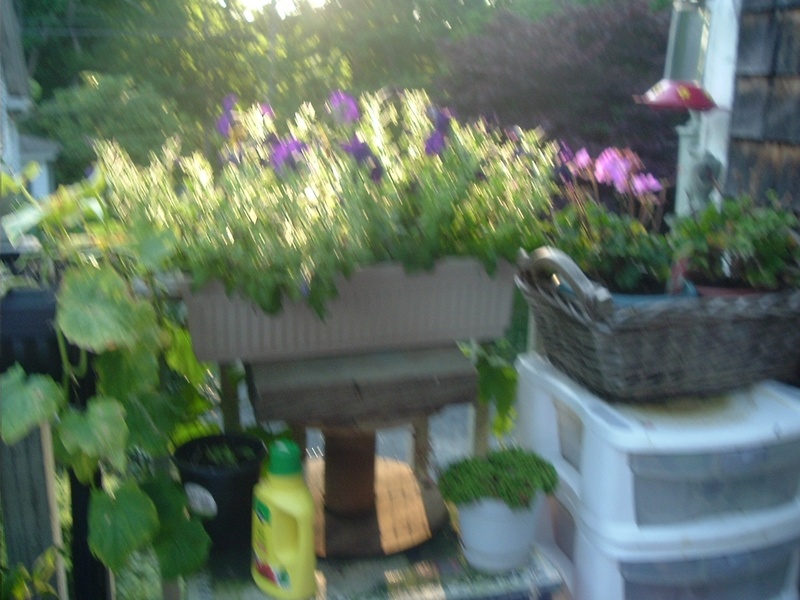 Finally I see some growth in the seeds and bulbs I planted within my little greenhouse. 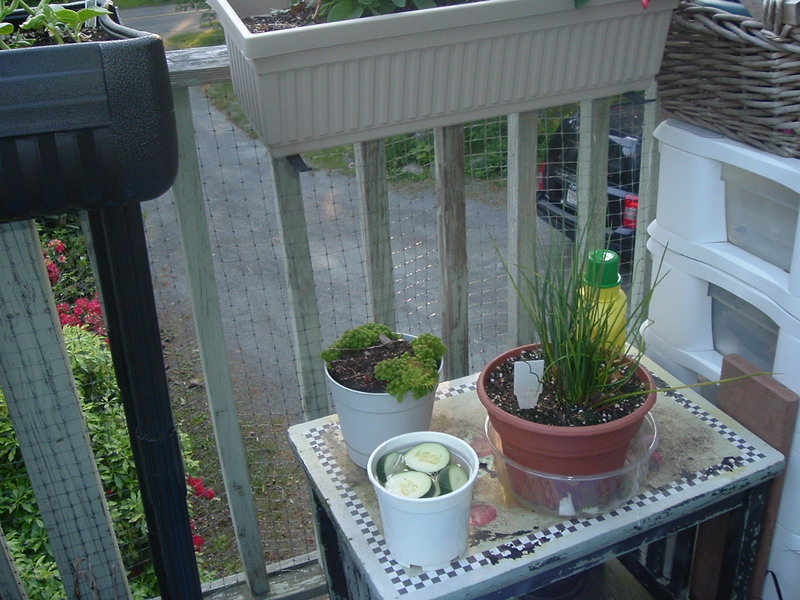 There is lettuce and green onions growing. 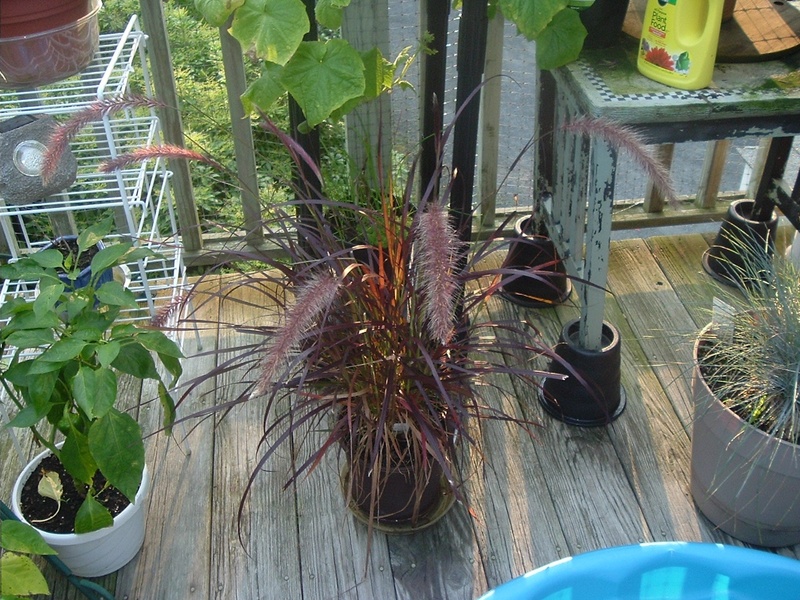 There are astillbe bulbs up about three inches. 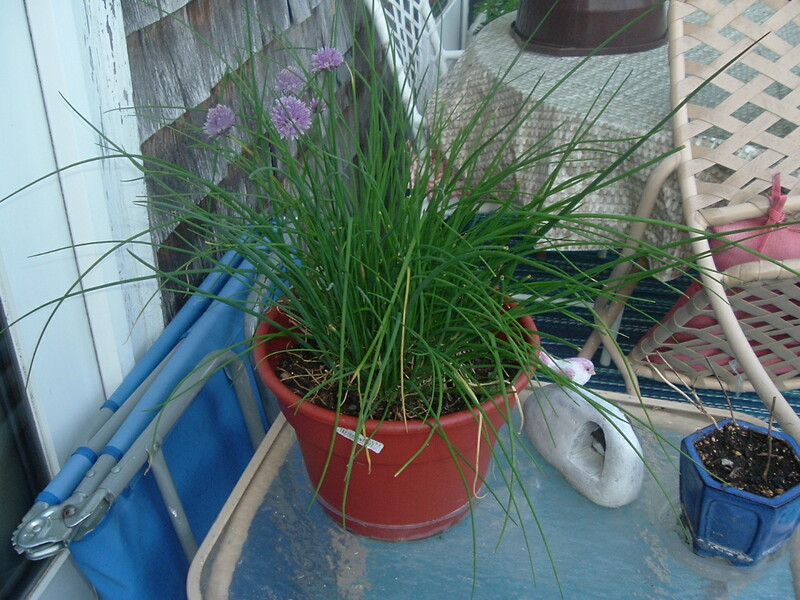 Also my chives have been growing for a few weeks and I have used most of what has grown to cook with. Enjoy these pictures! 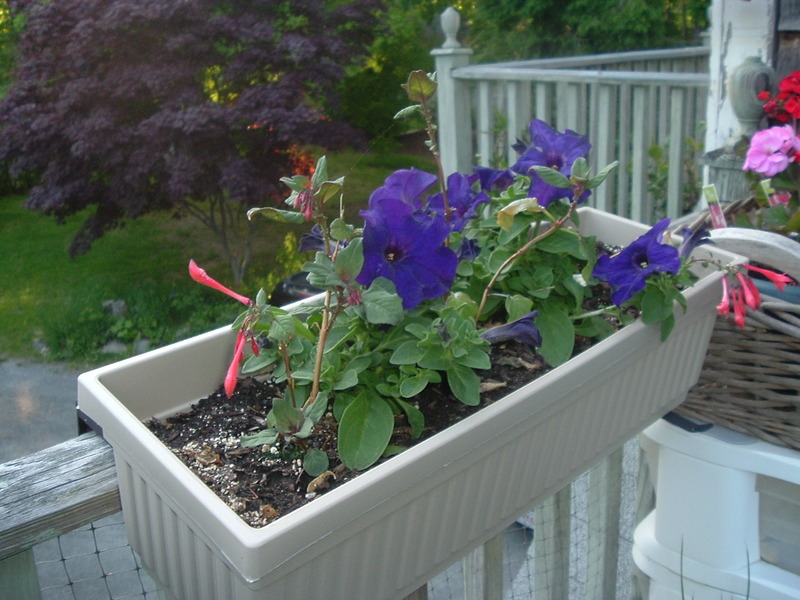 My Deck Garden is a summer success! 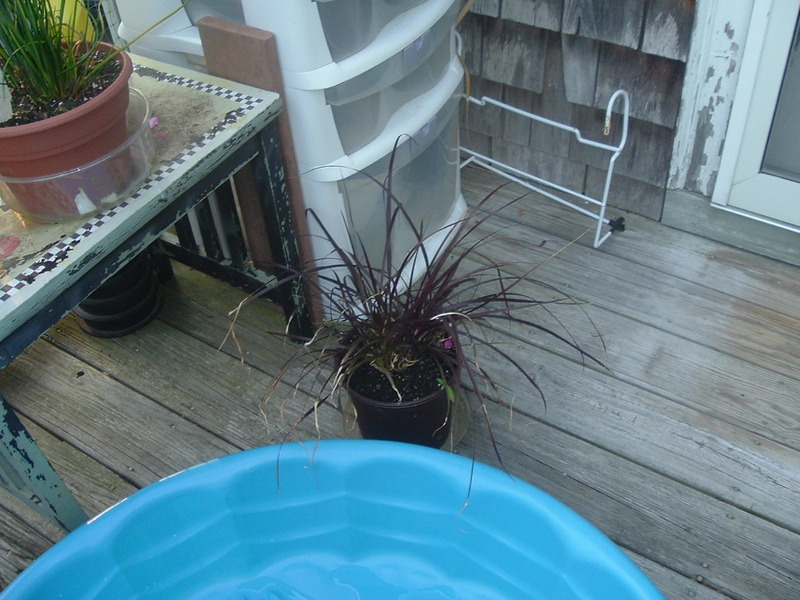 It’s been a busy summer and I cannot remember the last time I published pictures of my deck garden. It has been a success! 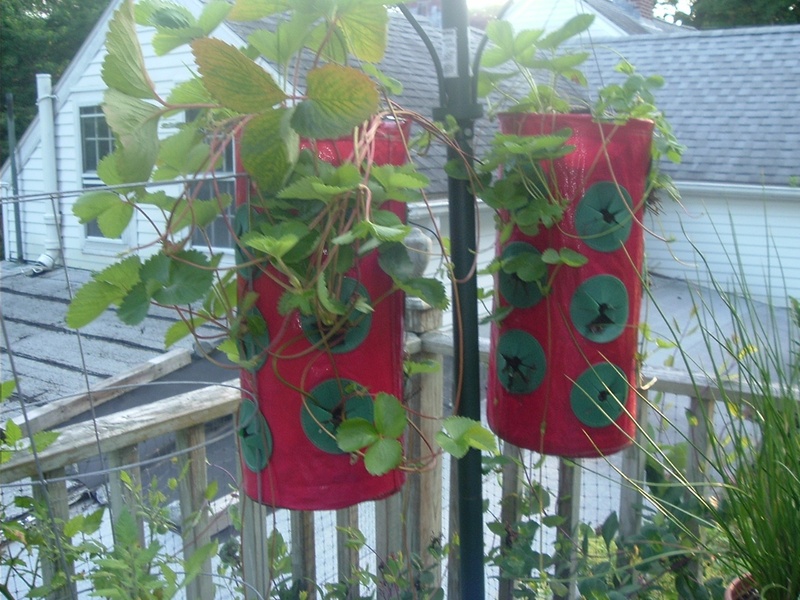 I have been eating cucumbers, cherry tomatoes, lettuce, onions, and green peppers. 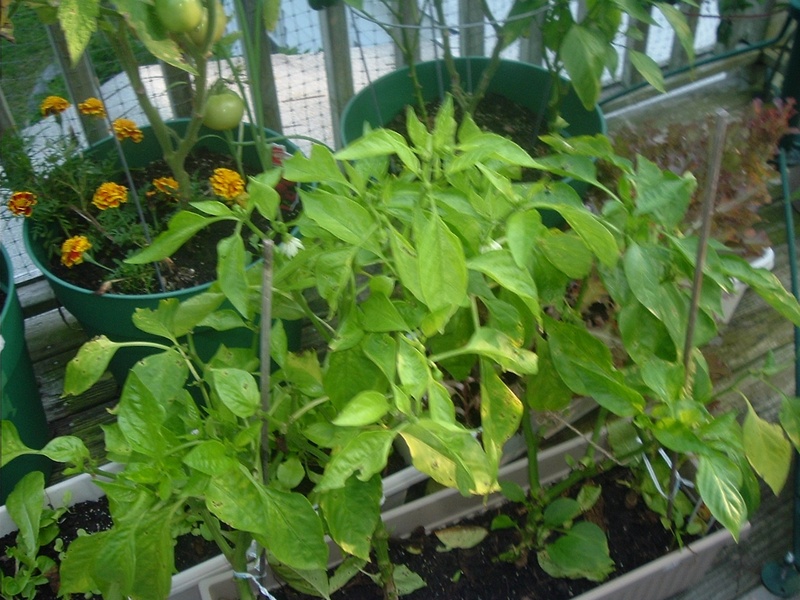 I have a lot of peppers growing and I am on my second planting of lettuce. 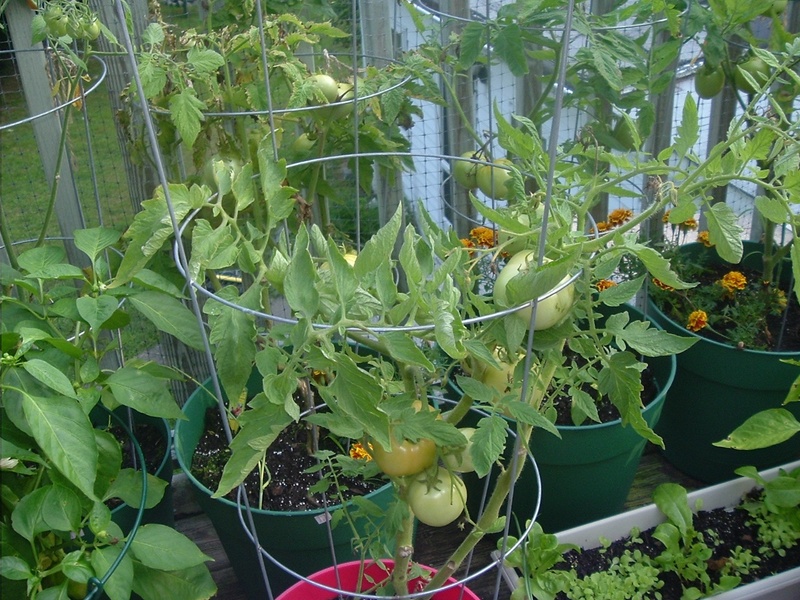 The larger tomatoes are still growing and some are turning color – can’t wait to eat those! 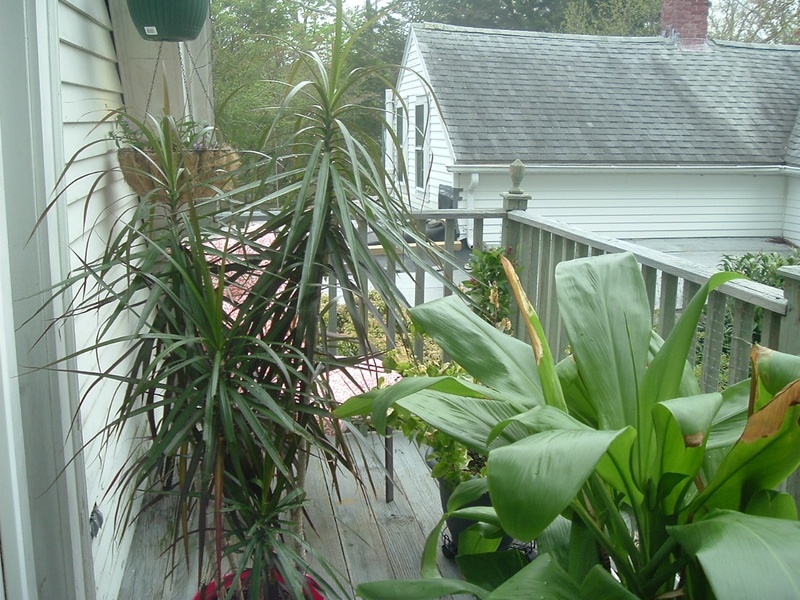 My front deck is like a jungle with tropical plants and flowering plants and people driving by and walking by comment on the color of my flowers. So here goes – more pictures – enjoy! 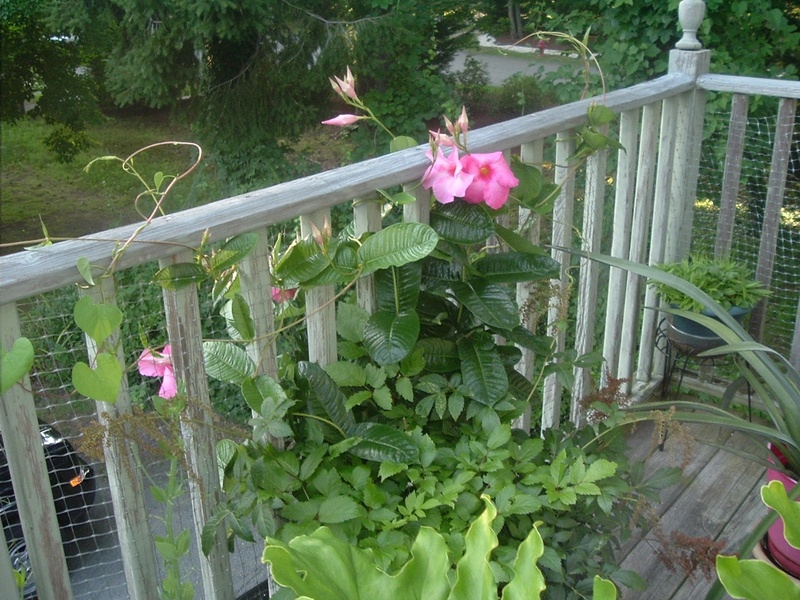 Hi there, well most of my plants and flowers on my decks are doing great. 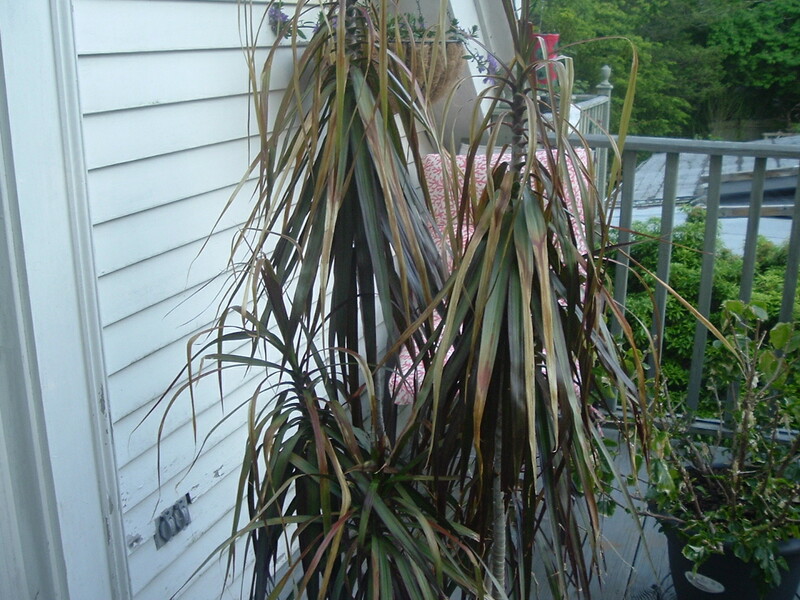 My tropical plants and my hibiscus have suffered a bit from the rather cold spring but I am sure that they will bounce back when the humid hot weather arrives. 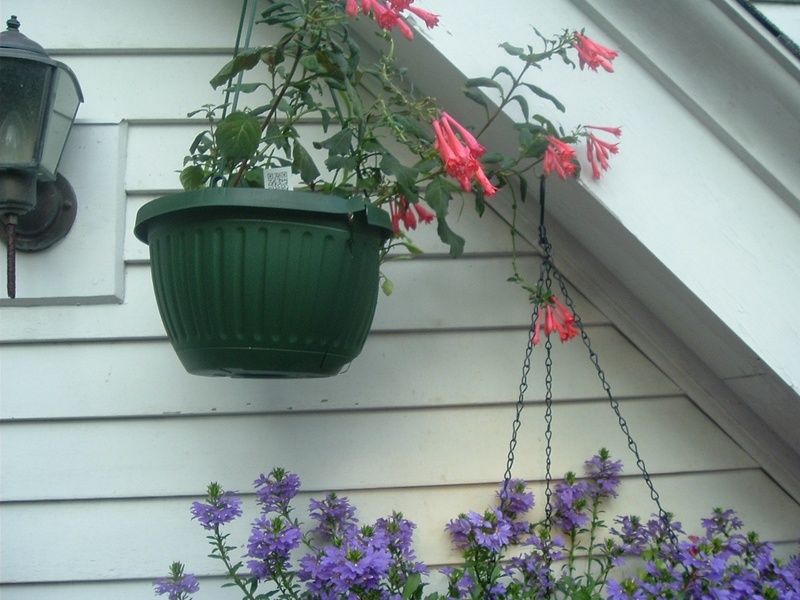 I have two new plants, a citronella and a honeysuckle which is just starting to open its flowers. 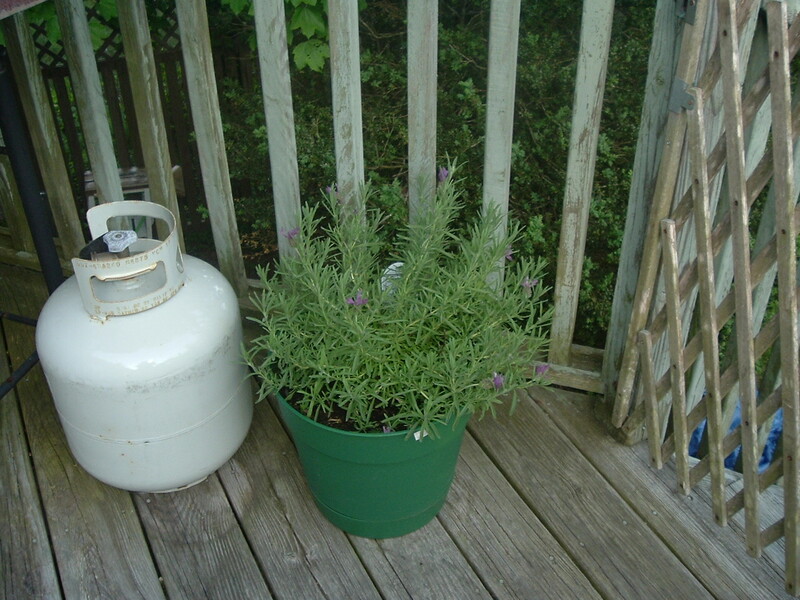 So between these two new plants and my lavender and jasmine, my deck should smell pretty good this summer. 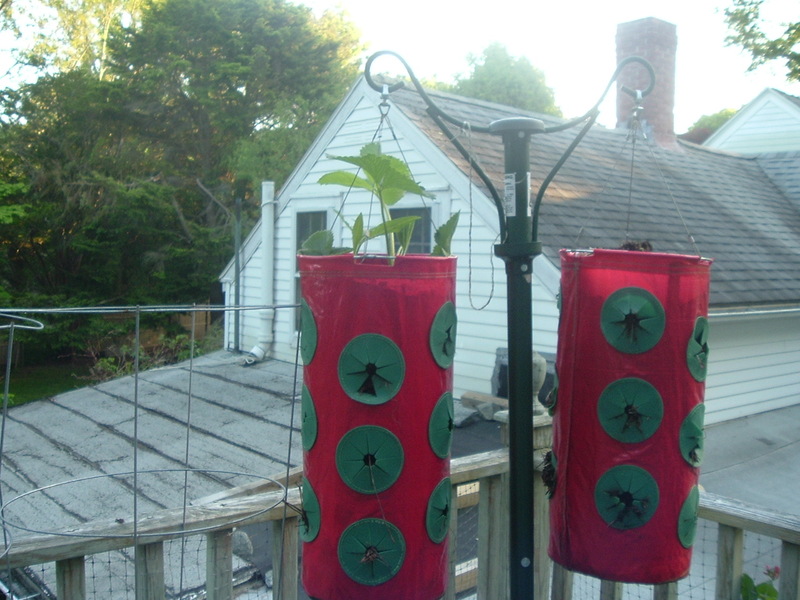 I have eaten lots of lettuce already and my cucumber plants are coming along and should be climbing soon. 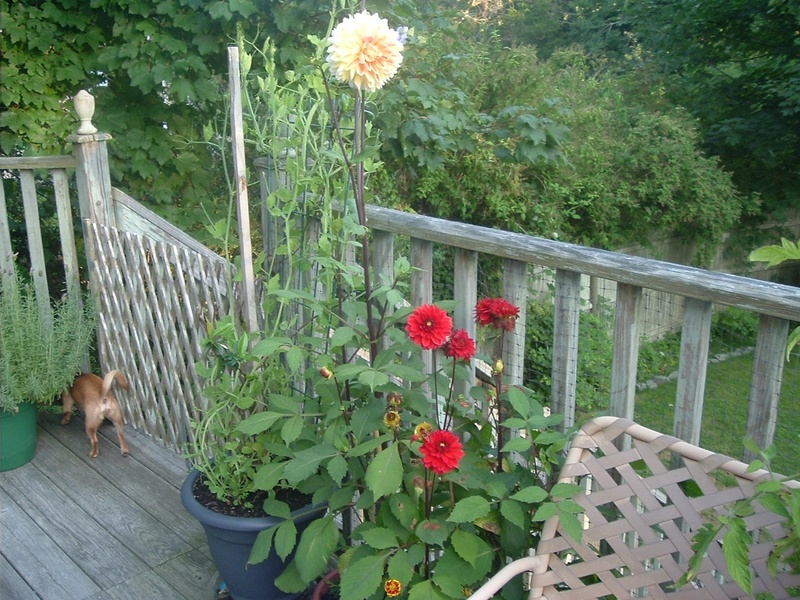 Tomatoes and peppers are also doing great with flowers on both. 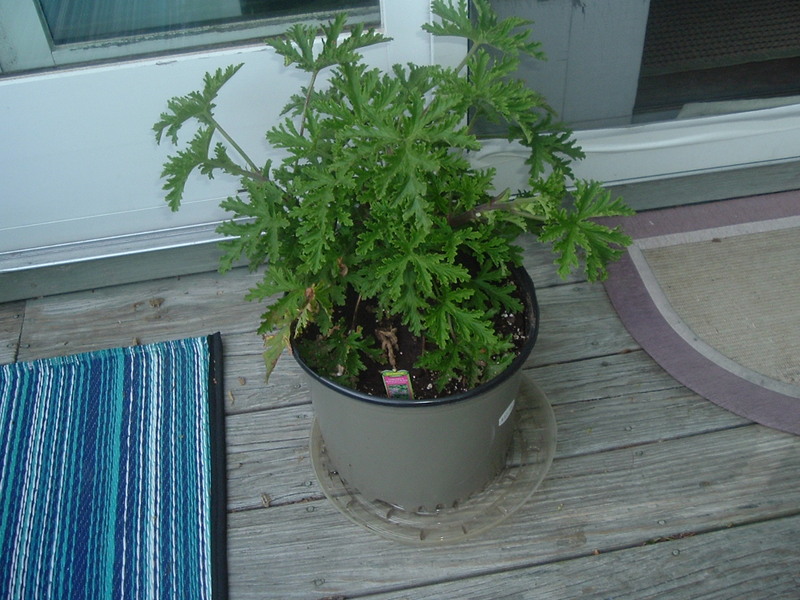 You can also see my new Japanese Poppy (bright orange big flower with other buds waiting to bloom) My sweet peas are growing and will be climbing soon. 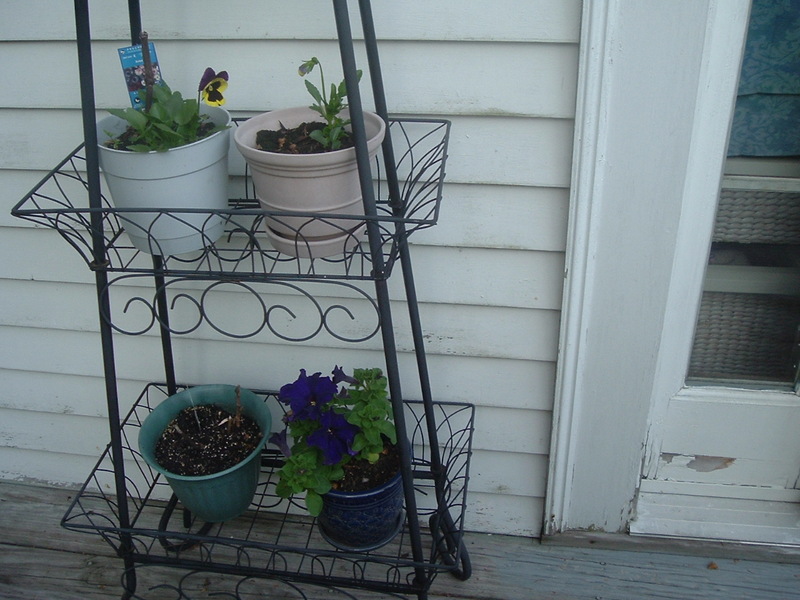 Between the sweet peas, moon flowers and other trailing plants, my front deck should look very colorful in the next month or so (depending on our weather) Enjoy the pictures! 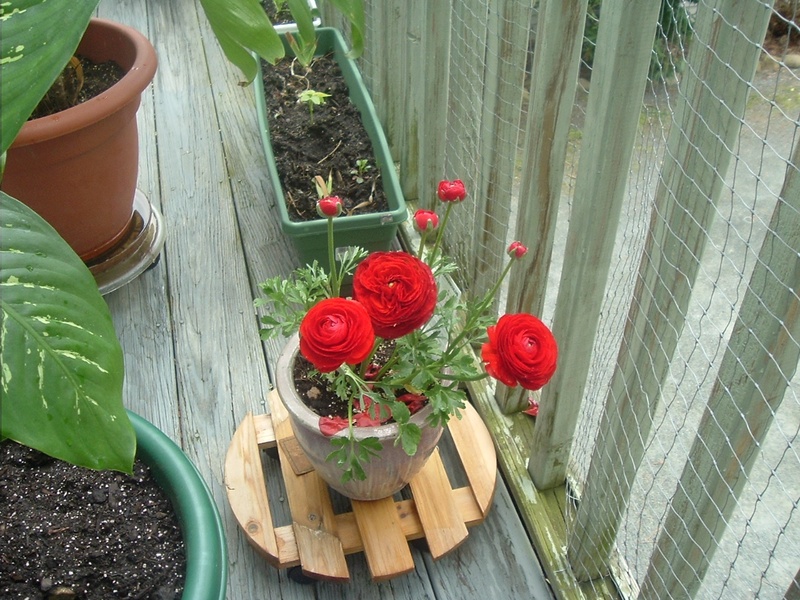 My Deck Garden is all planted! 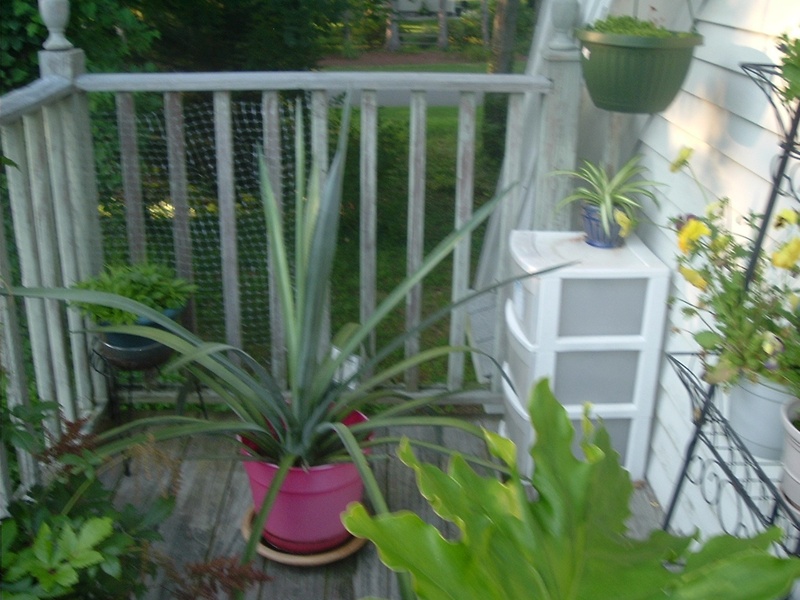 I have finally completed planting my deck garden for the season and moving my tropical plants outside. 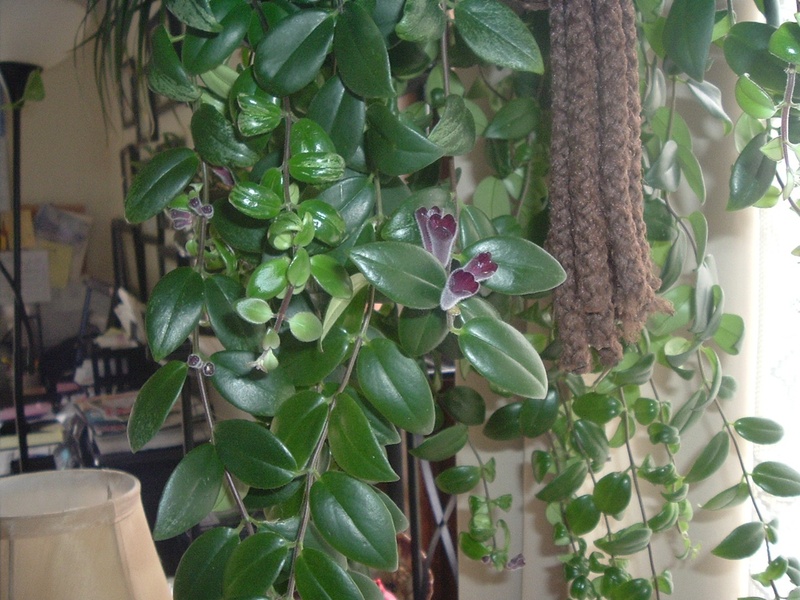 In the process of doing this, I noticed that my lipstick plant has flower buds which will open soon. 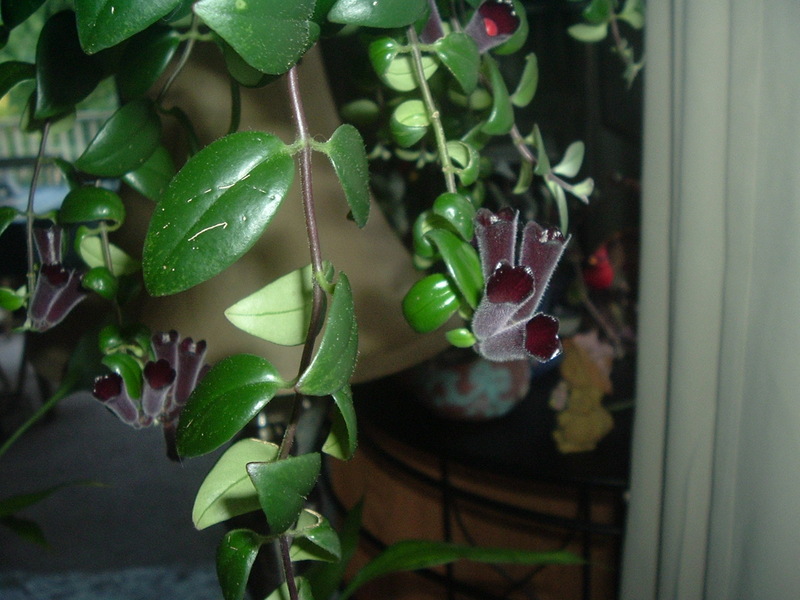 I have been waiting for more than a year for my lipstick plant to bloom so this was a very pleasant surprise! 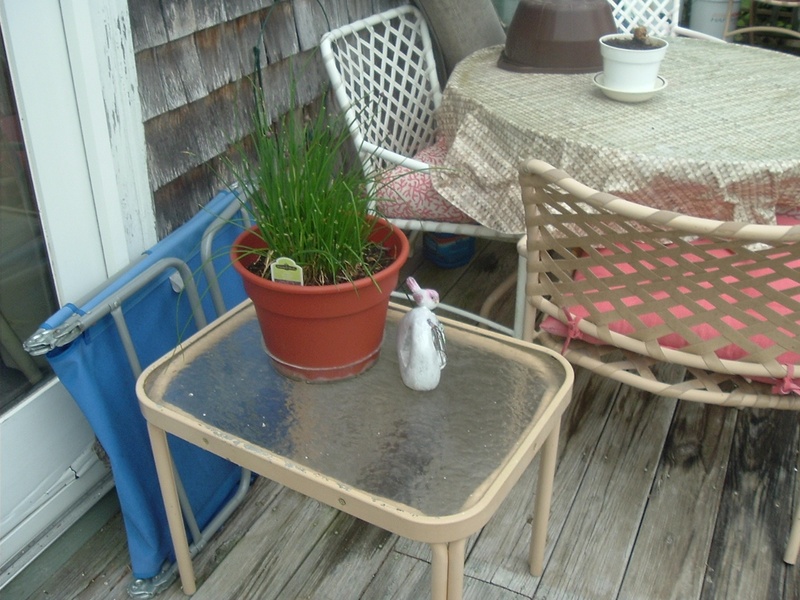 You will also see a glimpse of Nikki my Silky Yorkie (look under the table and you will see her behind!) and Sammy my Chi-Pom in the pictures. I will keep you posted on the growth of all my plants! 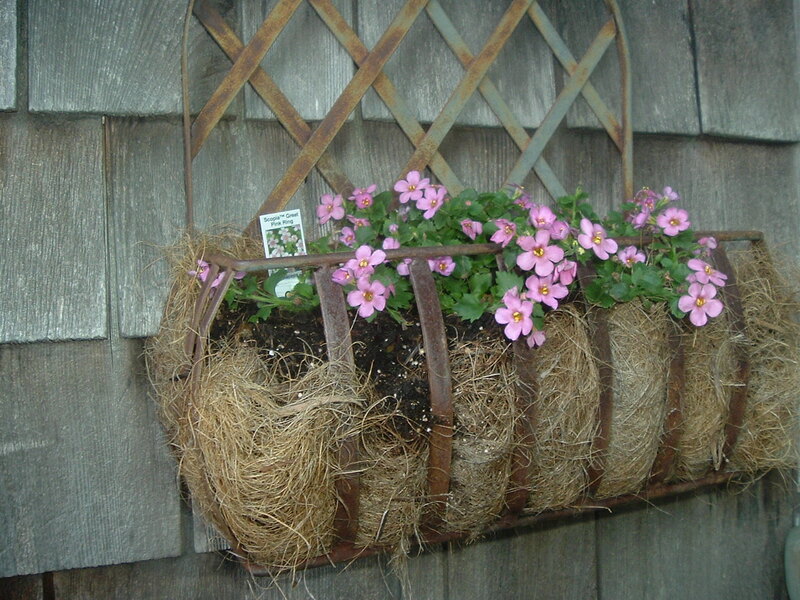 Well, I am still waiting for spring to arrive and as I wait and gather some gardening tools, I am pondering certain things. 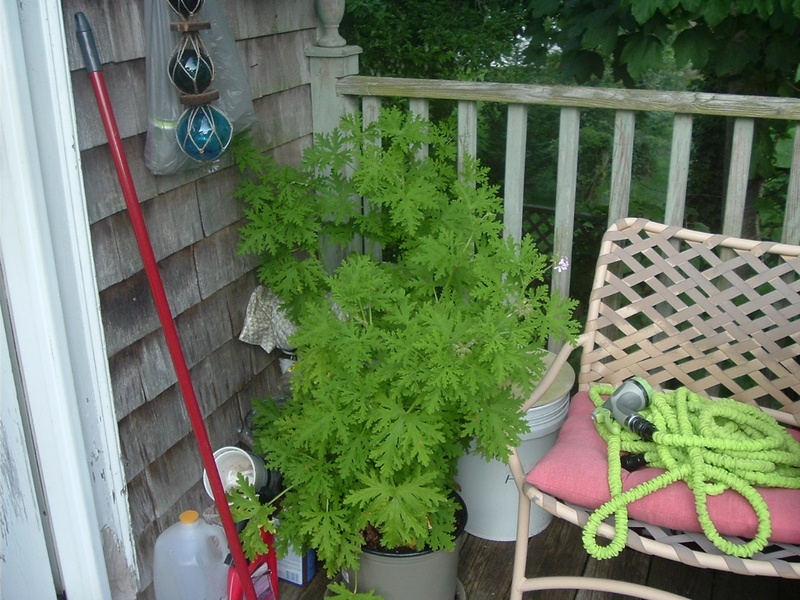 First of all, I invested in one of those pocket garden hoses and I am anxious to see how well it will work for me and my gardening on my decks. 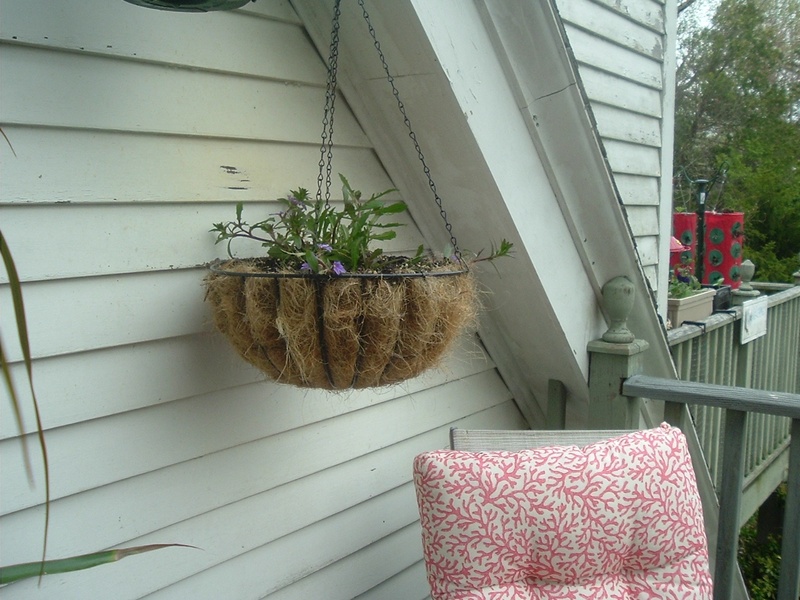 I am sure it will be better than using a milk jug to water my plants as this method took me an hour each day to accomplish. My daffodils came up but then were frost-bitten by the cold. My chives from last year made the winter and have sprouted up. The one tomato plant that I brought into my home has blessed me with one tomato (so far!) 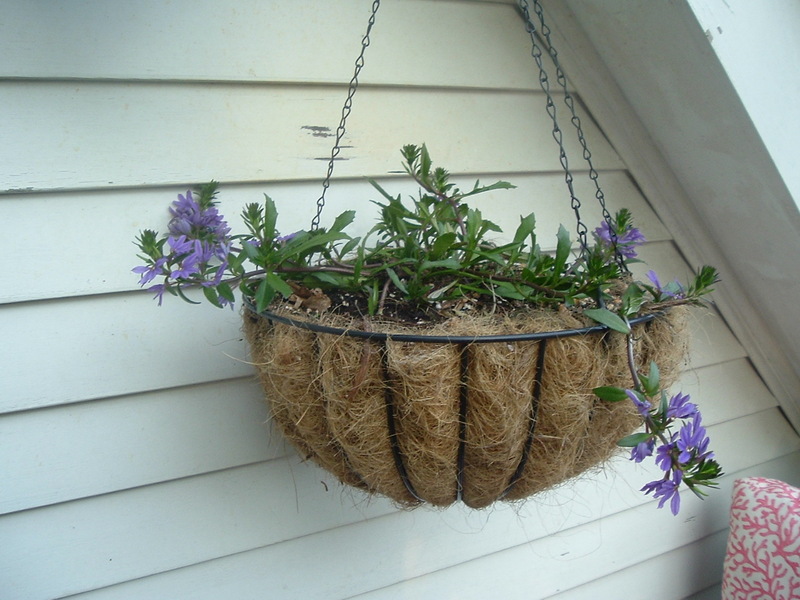 and there are other flowers on the scrawny plant. I am able to say that I have the first tomato of the season! 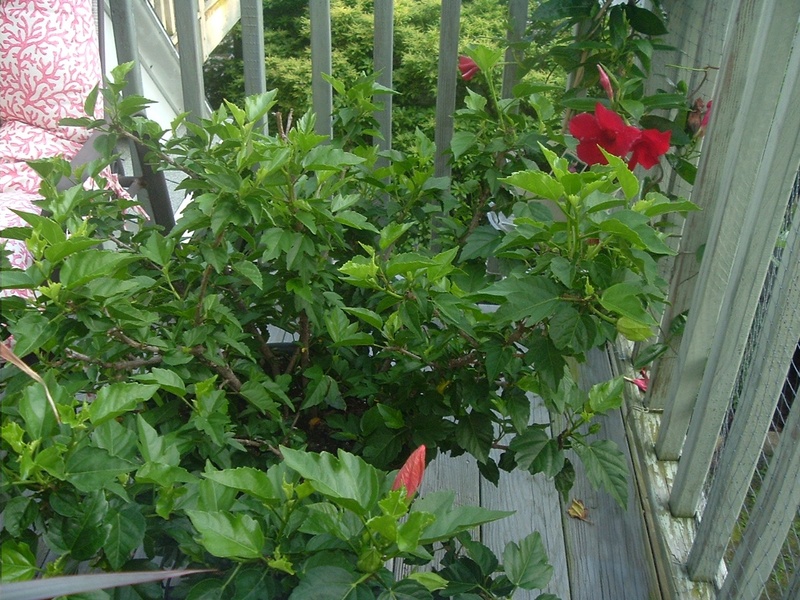 In addition, my hibiscus has been blooming for the last couple of weeks and has new leaves and flower buds on it. 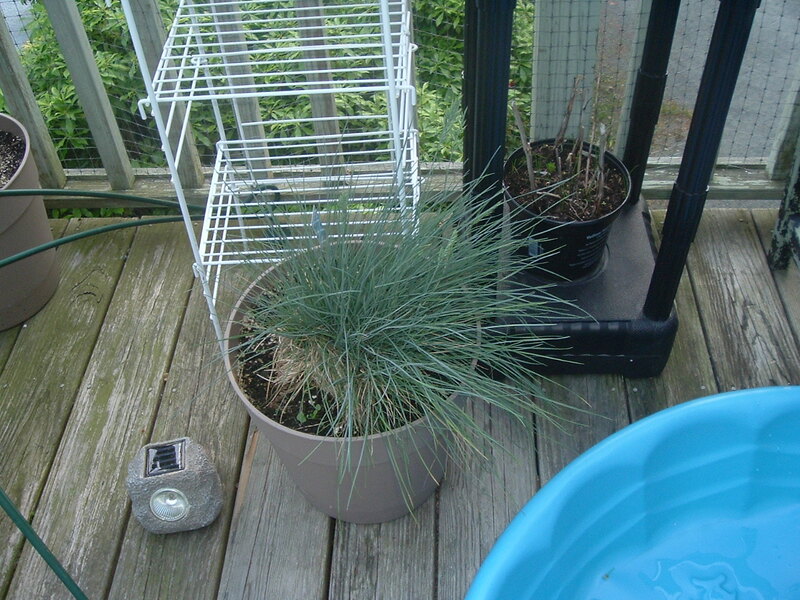 I keep it right in front of the slider window so it is getting more sunlight as the sun gets stronger. 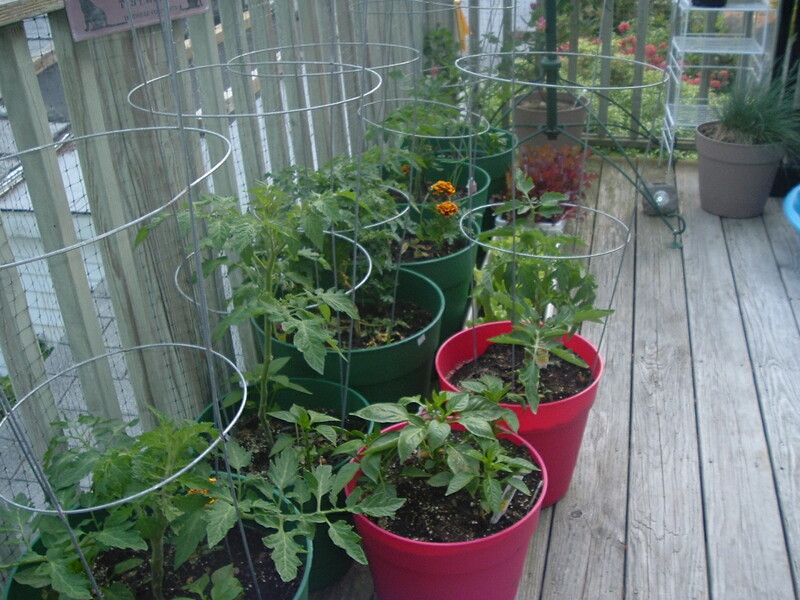 I can’t wait to start this year’s garden! 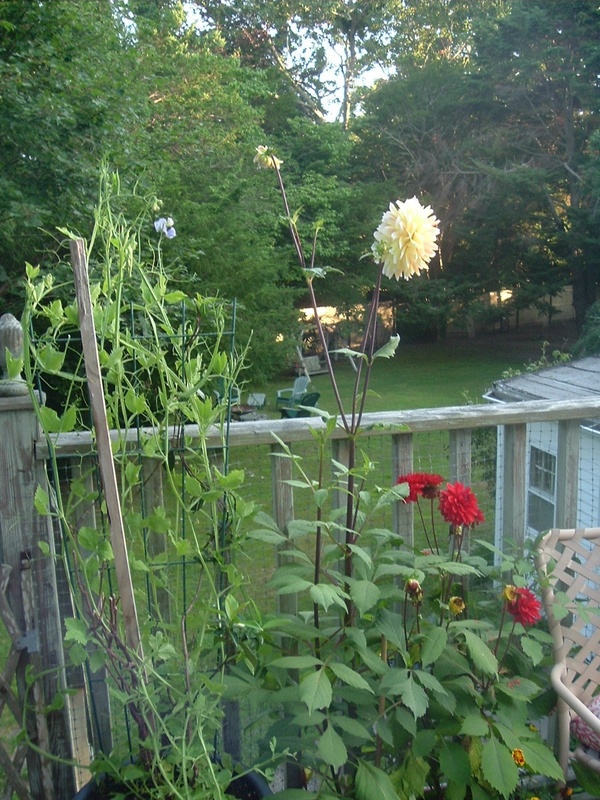 I have several seeds that I was able to save from last year from my sweet peas and my moon flower. In addition, I was introduced to some lovely petite sweet peppers and I have managed to save the seeds from these delicious peppers and dry them out. 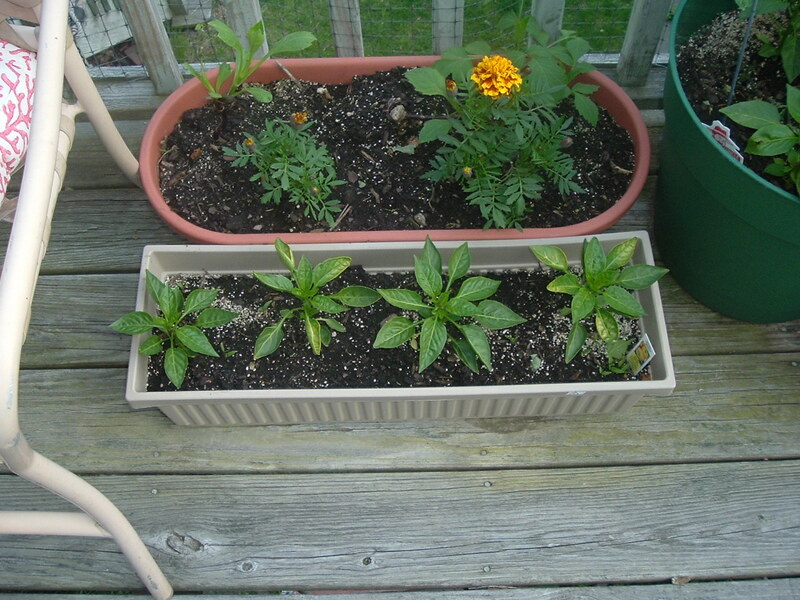 I am anxious to see if I will be able to grow these lovely red, yellow, and orange peppers. 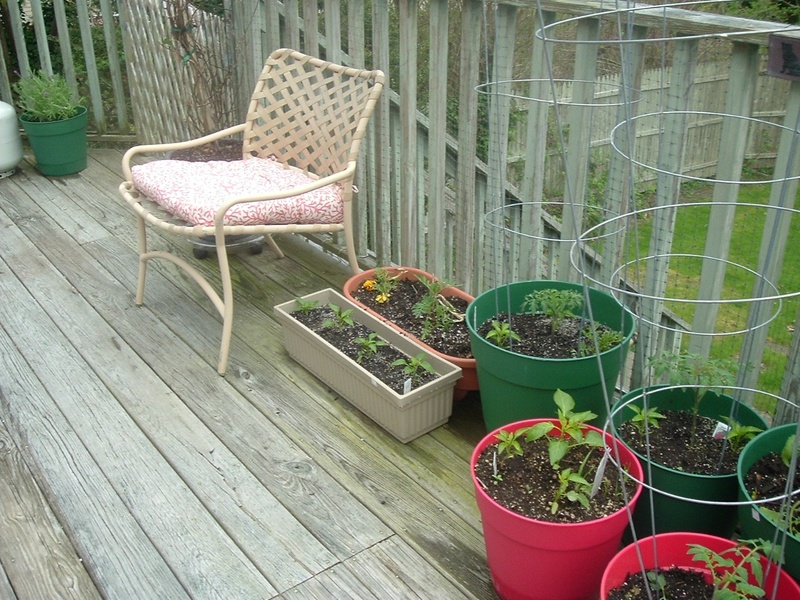 I plan on growing more peppers and tomatoes this year as I can freeze these items. Of course I will still grow cucumbers and lettuce for salads. 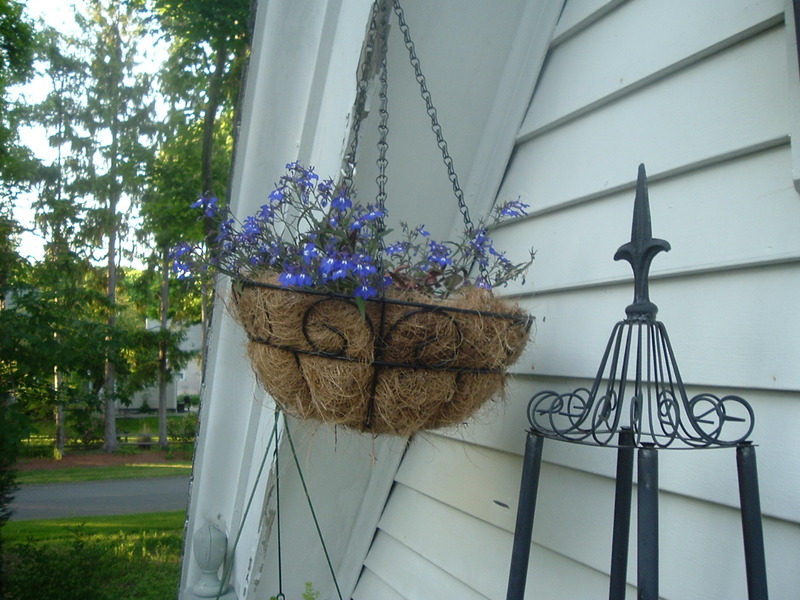 I think after all the rain and snow we have had this winter that it is going to be a dry summer. 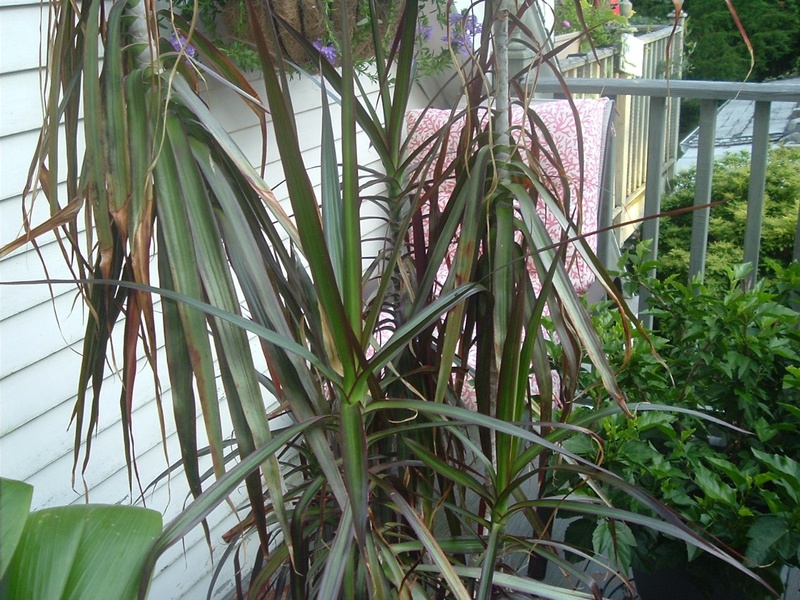 Still, it is too cold to put any of my garden plants or tropical plants outside yet. It will be a while before I can do that.